After a year in which refugees have dominated the global political agenda, Chaker Khazaal is living proof of the fact that displaced people can go on to huge achievements and inspire others. A Palestinian-Canadian author, reporter and entrepreneur, Khazaal spent his early life living in Bourj El Barajneh, a Palestinian refugee camp in Beirut. He later emigrated to Canada after winning the Global Leader of Tomorrow Award from York University in Toronto, for his excellent academic and leadership skills, in 2005. Besides writing, Khazaal formed a group of professional refugees from around the world offering them contractual remote employment in e-marketing, graphics, social media management, and different web solutions. His role in the business is to recruit clients and build the marketing strategies. Among the first clients was the Academy Award nominee for Best Foreign Picture, ‘Omar’. Shamma Al Mazrouei is the youngest ever member of the UAE cabinet, and the country’s first ever Minister of State for Youth Affairs. 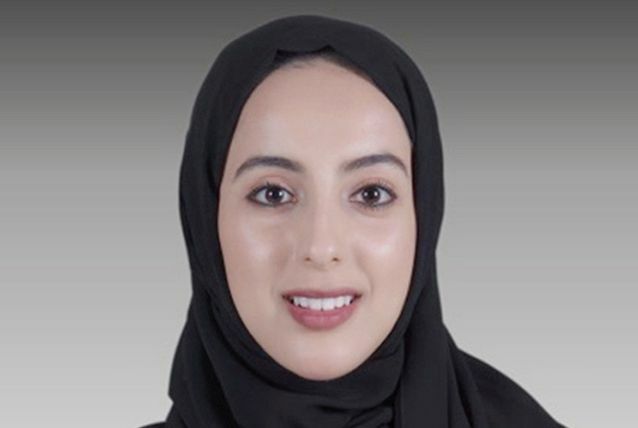 After studying at New York University Abu Dhabi, where her thesis was on the labour market prospects for Emirati women, she won a Falcon Scholarship to study at Oxford University in the UK, where she took a Master’s degree in public policy. She was a co-designer of the NYUAD Al Nahda Institute. As part of the largest government reshuffle in the history of the UAE, Al Mazrouei was handed her new brief earlier this year. 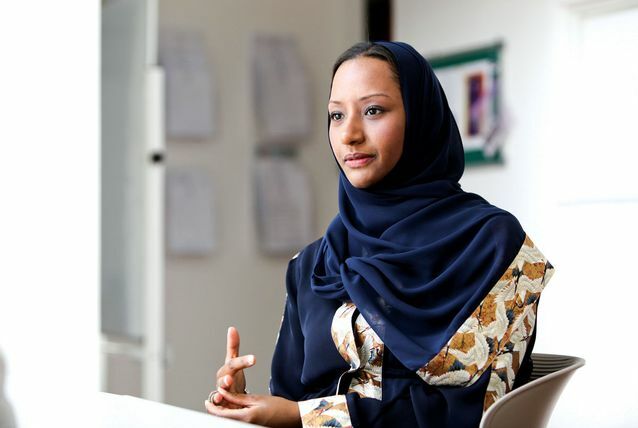 Five years ago, 28-year-old Alkhudair left a comfortable job at auditor KPMG and set up Glowork, a company that focuses on solving female unemployment in Saudi Arabia. By his own estimates, Glowork has now helped over 26,000 women find direct jobs in the kingdom, while a far greater number have benefitted from access to the firm’s advice and career fairs. From a wider perspective, Glowork has been at the heart of a quiet yet seismic shift in the Arab world’s largest economy, which has been slow to recognise the vital contribution that women can make to the workforce. There are now eight times as many working Saudi women — 490,000 in total — than there were four years ago. “Continuously, on a day-to-day basis, my ideas are boiling. I really want Glowork to be the Virgin of the Middle East — an empire based on women balancing work and life,” Alkhudair told us last year, in reference to Richard Branson. The list of achievements on Noura Al Kaabi’s resume grows longer every year. She was appointed as Minister of State for Federal National Council (FNC) Affairs as part of the UAE government reshuffle earlier this year — testament to her lengthy career with the country’s highest consultative body. 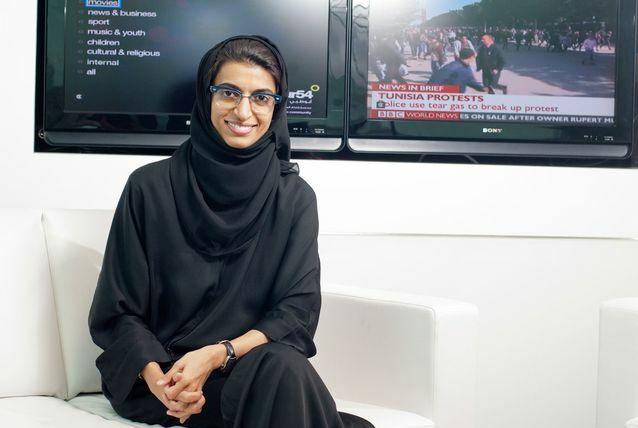 Aside from her work with the FNC she is also one of the UAE’s most influential media officials. Al Kaabi was previously CEO of twofour54, Abu Dhabi’s media free zone, an organisation which she now chairs. She was instrumental in helping to develop the UAE capital’s policy to convince filmmakers to shoot more of their movies in the country. The latest result of that plan was the recent ‘Star Wars’ film, which opened last year and showcased the deserts of Abu Dhabi to the world. 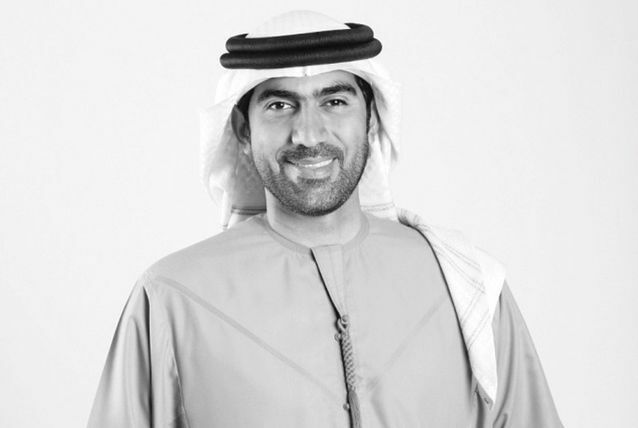 Al Kaabi is also a member of the Executive Council’s Economic Development Committee, and a board member of the UAE’s National Media Council, Abu Dhabi Media, Image Nation, the Abu Dhabi Sports Council and the United Arab Emirates University (UAEU). Bader Al Kharafi is one of the heads of the family conglomerate MA Al Kharafi & Sons Company. Established in 1956, the group is now estimated to be worth more than $8bn, with more than 135 registered companies operating in 28 countries, across sectors including construction, trading and manufacturing, investments and development, and travel and leisure. Al Kharafi took the helm as director of the group’s executive committee in 2012, following the death of his highly esteemed father, Nasser. He holds several high-profile roles within the family business, including as a board member of Gulf Bank, a board member of Foulath Holding (Bahrain Steel) and chairman and managing director of Gulf Cables & Electrical Industries. He was recently elected vice chairman of Zain Group, the telecommunications giant that operates in eight countries across the Middle East and North Africa, with about 44.3 million customers and $4.3bn in turnover. In April 2014, Coutts, the wealth division of the Royal Bank of Scotland Group, announced it had appointed Al Kharafi to its Middle East Advisory Board. The world’s biggest construction project is taking shape right now in Saudi Arabia, and Fahd Al Rasheed is the man leading it. The $100bn King Abdullah Economic City megaproject is being built from scratch about 100km north of Jeddah with an eventual capacity to host 2 million people. At the centre of the city is a huge port, while there is also an industrial valley, as well as residential communities, tech clusters, universities and hospitals. Haramain Station on the eastern side will link the city to Jeddah and the holy cities of Makkah and Madinah via Saudi Arabia’s latest high-speed rail network. KAEC already has provided about 12,000 jobs and more than 70 companies are in the process of setting up bases, including multinationals Mars, Pfizer and Danone, and local family giants Abdul Latif Jameel and the Naghi Group. When it is finished, not likely until at least the middle of the next decade, KAEC is expected to be as big as Washington, DC. “The next 10 years will focus on expanding the residential and recreational amenities in the city to make it the best environment to live and work in Saudi Arabia,” Al Rasheed told us recently. Seif Abou Zaid is a social and policy entrepreneur, who focuses on education and its relationship to governance. After graduating from the American University in Cairo with a degree in political science, Abou Zaid found himself drawn towards entrepreneurship. 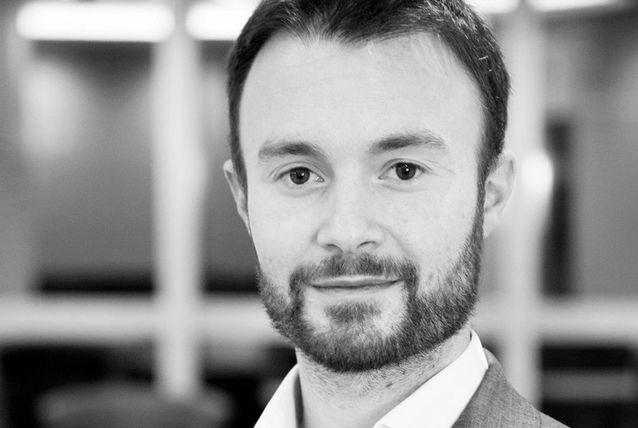 He co-founded Agency for Development and Enhancement, which aims to train young people between the ages of 15 and 35. Since then his Nabadat Foundation, which aims to use technology to improve education and enhance political awareness, has also grown from strength to strength. 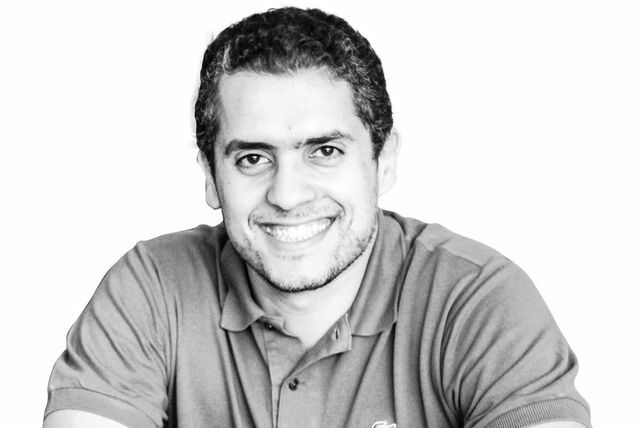 Abou Zaid is the CEO of Tahrir Academy, a blended learning platform that creates mind-stimulating learning experiences for more than 160,000 registered Egyptian and Arab learners, empowering them to think, choose and decide. 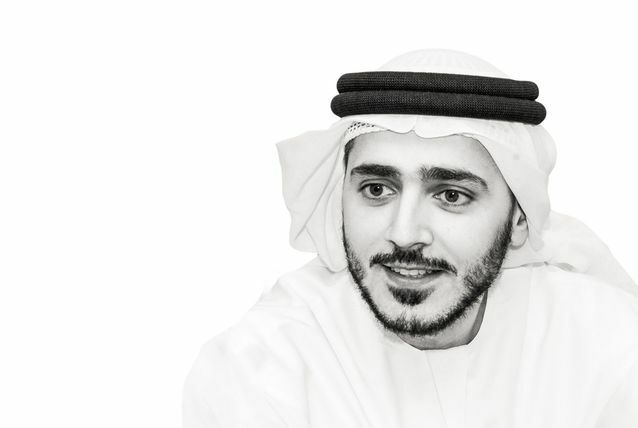 Dr Ahmad Belhoul is another member of the UAE’s young generation to be handed a place in the country’s cabinet. The former CEO of renewable energy city Masdar was appointed as Minister of State for Higher Education earlier this year. Prior to joining Masdar, Belhoul was the CEO of strategy and tourism sector development at Dubai’s Department of Tourism and Commerce Marketing (DTCM). During his tenure at DTCM, he played a leading role in developing Dubai’s Tourism 2020 strategy. He also serves on the board of Emirates Development Bank, a financial institution set up by the UAE government to promote economic growth in the country through the provision of funding to small and medium-sized companies, industries of strategic importance and key housing developments. Belhoul has a PhD from Sir John Monash University in Australia, an MSc from the University of Melbourne and a BSc from Khalifa University in the UAE. 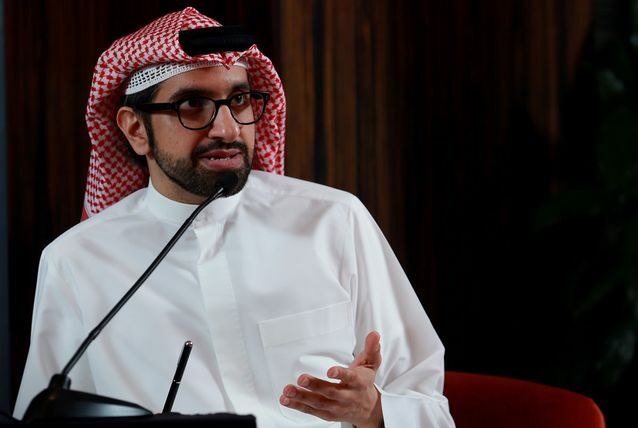 Sultan Al Qassemi is something of a rarity in the Gulf — a prominent national who is completely unafraid to speak his mind. As such, he has become one of the most respected GCC residents on Twitter, with nearly 430,000 followers hanging onto his every word. 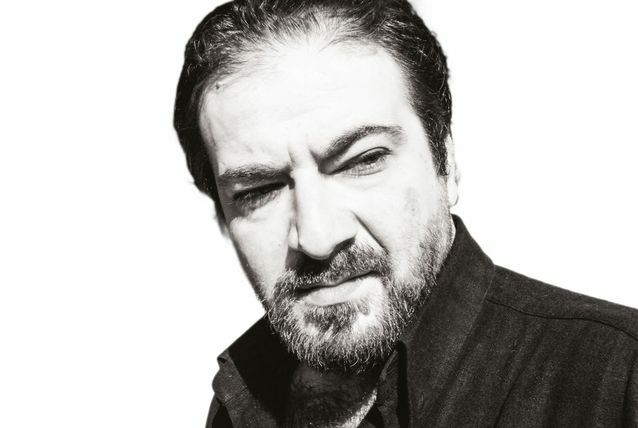 The Sharjah native came to worldwide prominence during the ‘Arab Spring’ revolutions, when Al Qassemi’s rapid Twitter output established him as an authoritative voice on Middle Eastern affairs. “I felt, in a tiny, minuscule way, that I contributed — among many, many other people — to what happened,” he told The Guardian newspaper in 2011. Lina Atallah was the editor of Egypt Independent before it was closed down by the country’s authorities. 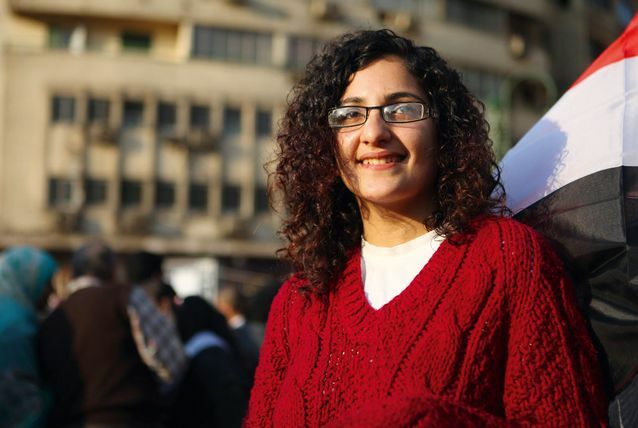 Undeterred, she gathered together the cream of the paper’s young journalists and founded Mada Masr, an online newspaper. Mada, which means “span” or “range” in Arabic, but is also the spot where a stone is placed on a ring, a symbol of taking a position, and Masr is often referred to as Egypt. The website was launched on June 30, 2013, the day that a mass demonstration calling for the resignation of Mohamed Mursi, Egypt’s president, was planned. Mada Masr was Attalah’s seventh news venture; many of the previous ones had closed because of successive governments’ attitude towards independent-minded journalists. As well as editing Mada Masr, Atallah has written for numerous publications including Reuters, Al Masry Al Youm and Cairo Times, and has worked as a radio producer and campaign coordinator for the BBC World Service trust. In a country where the situation for journalists has become “intolerable”, according to Reporters Without Borders, Mada Masr has become one of the few independent, critical voices. The second youngest son of the slain Lebanese prime minister Rafik Hariri, Ayman Hariri is a dominant figure in the lucrative Saudi construction sector. 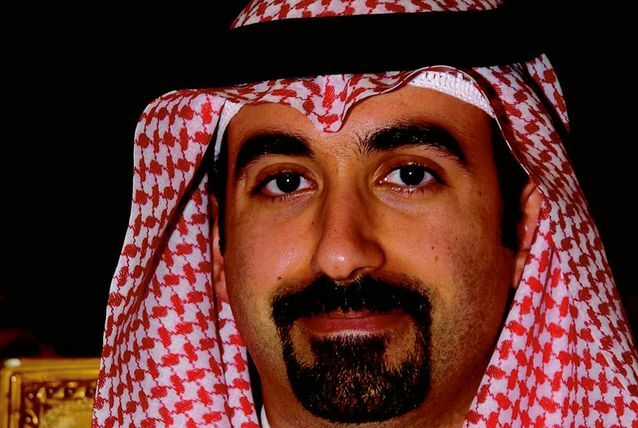 Involved in running Saudi Oger, one of Saudi Arabia’s biggest construction companies and the source of the Hariri family fortune, he has a hands-on role in many of the kingdom’s major infrastructure projects. Some of his most significant projects include King Abdullah University for Science and Technology, King Khaled International Airport in Riyadh and the kingdom’s first privately-financed airport, the new $1.4bn Madinah Airport. However, in recent months the unprecedented effect of lower oil prices on the kingdom’s revenues has put pressure on the sector, tightening Saudi Oger’s finances so much that it is now being investigated by the Labour Ministry for claims it has not paid staff. Nevertheless, the billionaire’s reputation for being one of the rare executives with a deep knowledge of the sector will surely see Saudi Oger bounce back. Hadeel Ibrahim is the founding executive director of the Mo Ibrahim Foundation – a position she took on aged just 22 - which was established in 2006 to support great African leadership. The Foundation was established by Mo Ibrahim, Sudanese-born telecommunications billionaire, and offers a $5m prize to an African head of state who has demonstrated excellence as a leader based on the Mo Ibrahim Index of African Governance. She is also co-chair of the board of directors of the Africa Center in New York, which will attempt to help the US better understand and engage with contemporary Africa. Ibrahim sits on the boards of the Clinton Foundation and the Mary Robinson Foundation for Climate Justice. She is a member of the Royal African Society Council and a patron of Restless Development, a youth-led development agency. Yehia Abugabal has made it his life’s mission to fight cancer. He is the co-founder of the International Cancer Research Center, a Cairo-based institution devoted to battle the disease in the Middle East through dedicated teams specialised in medical oncology, radiotherapy, radiology, pathology, and surgery. The centre is crucial in addressing a disease that is not only the number one cause of death worldwide, but also dramatically difficult to cure in the Middle East, one of the regions with the lowest rates of recovery for patients with breast cancer. Earlier this year, Abugabal was recognised by Forbes magazine on its annual ’30 under 30’ list and his future career in scientific research is bright. 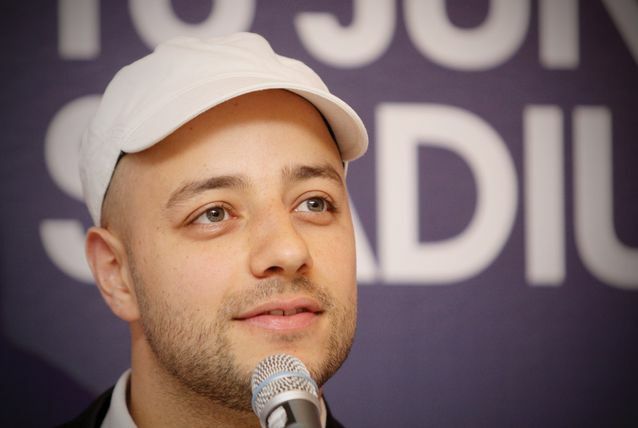 Maher Zain is the world’s biggest Islamic music star – and a legend to his 26 million fans on Facebook. 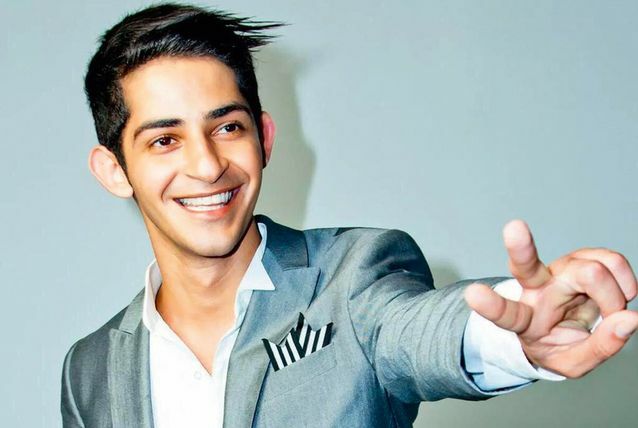 Zain, whose family emigrated to Sweden when he was just eight, entered the music industry as a producer working alongside Grammy award-winning music executive RedOne, famous for his work with the likes of Lady Gaga, Nicki Minaj and Jennifer Lopez. But in 2009 he returned to his Islamic roots and focused on writing and singing his own contemporary R&B music with a strong Muslim influence. His first album, ‘Thank You Allah’, was released on November 1, 2009, by Awakening Records. It became the highest-selling album of 2010 in Malaysia and went multi-platinum in Malaysia and Indonesia, where he has had his biggest successes. His second album ‘Forgive Me’ released in April 2012, also went multi-platinum in Malaysia. Zain sings mainly in English but has released some of his most popular songs in languages such as French, Arabic, Turkish, Malay and Indonesian. He also supports UNHCR — the UN Refugee Agency and recently visited Syrian refugee camps in Lebanon, where he performed a concert. 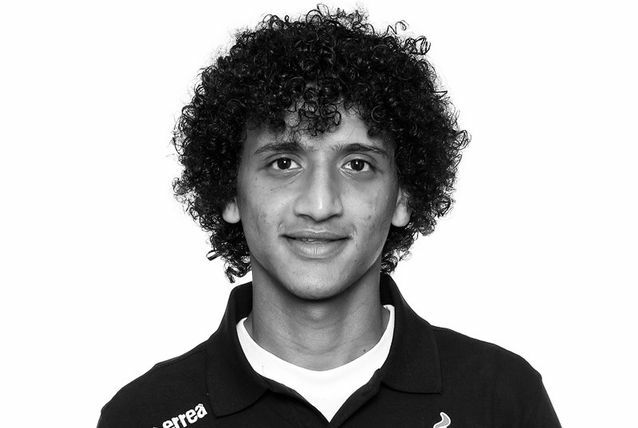 Omar Abdulrahman has a good claim to being Asia’s best football player – he is certainly the greatest Emirati player of his generation. Nicknamed Omoorry, he plays as a winger and attacking midfielder for the UAE’s national football team, as well as Al Ain. International soccer association ESPN ranked him number one in the top ten Asian players of 2012, and he was voted Emirati Player of the Year, Fans’ Player of the Year and Young Arab Player of the Year at the end of the 2012/13 season when his side won the 2012 Super Cup league. The 23-year-old started his career on trial with Al Hilal Saudi FC in 2000 and joined Al Ain in 2007 when he was just 15. He made his debut in 2009, winning his first senior honours, such as the Etisalat Cup, the Presidents’ Cup and the Super Cup. In February last year, Abdulrahman agreed a new four-year contract with Al Ain thought to be worth AED14m a year. That appears to rule out a long-speculated move to Europe. As well as the trial with Manchester, he has also been offered a loan deal with Benfica, which he turned down. Whether it’s music, fashion, shipping or tech, Badr Jafar seems to have tried his hand at most sectors over the years. The Sharjah native is the CEO of Crescent Enterprises, which has interests in ports, logistics, power and engineering, healthcare and business aviation. Among his ventures are the Pearl Initiative, a not-for-profit he founded with the United Nations Office for Partnerships in 2010 to improve corporate transparency across the Gulf. He is a staunch advocate of entrepreneurship and a member of numerous bodies to support SMEs, including the Global Board of Education for Employment and Synergos Arab World Social Innovators. He also chairs the Alumni Advisory Council of the Cambridge University Judge Business School in the UK, where he gained his MST after studying at Eton College and then Cambridge University. Jafar is as comfortable in the recording studio as in the boardroom — in 2011 he and legendary producer Quincy Jones released an Arabic charity single entitled ‘Tomorrow/Bokra’, presented by pop star Shakira and featuring 26 Arab artists to raise money for educational arts projects for disadvantaged youth across the MENA region. The same year, Jafar and Hollywood actor Kevin Spacey launched a not-for-profit theatre academy in the Middle East. 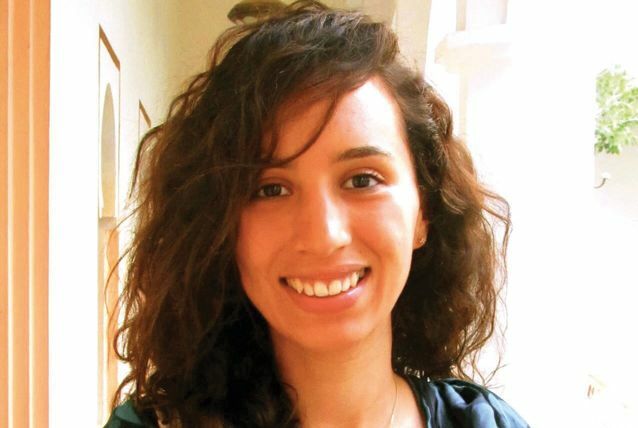 While still a student herself, Maha Laziri founded Teach4Morocco, a non-government organisation, in 2011. The entity has rebuilt a school in a remote village in the Atlas Mountains, is building a second school nearby and is working to improve the curricula across the Moroccan school system. All of the organisation’s employees are aged under 30, belong to different Moroccan institutions of higher education and share a desire to affect lasting change. With so many remote villages in the North African country, many children, particularly girls, do not finish school or receive a sub-standard education. But Teach4Morocco advocates a ground up approach whereby Moroccans take an active role in improving the current educational system so that one day all Moroccan people will have a quality education. The projects have been funded by the French institute Sciences Po Aix, and have been helped by volunteers from local villages. Yousef Munayyer has been front and centre during the battle to change American minds about a slew of issues that affect the Arab world. From the occupation of the Palestinian territories to the rise of Donald Trump, Munayyer provides regular commentary on US media. He is executive director of the US Campaign to End the Israeli Occupation, and has also served as executive director of the Washington DC-based not-for-profit the Jerusalem Fund for Education and Community Development and The Palestine Centre. Both organisations aim to provide humanitarian support to Palestinian people and promote Palestinian-Arab culture in the United States. Munayyer contributes to American newspapers including the Washington Post, Chicago Tribune and Boston Globe and has appeared on numerous international television and radio programmes to discuss the Middle East. In particular, he has criticised Israeli occupation of Arab territory and called on the US government to implement a fundamental policy change. From controversial legal cases, campaigns for free speech, public fundraising for US presidential hopeful Hillary Clinton to her famous husband George Clooney and what she wears wherever she goes, Amal Clooney has become a daily headline grabber. The human rights lawyer’s fame skyrocketed when she married Clooney in 2014, doing what no other woman had managed to do — take Hollywood’s most eligible bachelor off the market. Clooney (nee Alamuddin) was in the UAE earlier this month to make a keynote speech at the Sharjah International Government Communication Forum, where she expounded how respect for international law can improve a nation’s image globally. A week earlier, she made a rousing presentation in India deploring the increase in authorities’ stifling of free speech, making reference to Turkish President Recep Tayyip Erdogan’s takeover of a newspaper and the arrest of students in India for sedition. “There are three Rs responsible for the crackdown on freedom of speech in today’s world — royalty, rulers and religion. The state needs to understand that stifling criticism can have serious repercussions,” she said. Having already represented the likes of Julian Assange, the Bahraini king and jailed Al Jazeera journalist Mohammed Fahmy, Clooney managed to win the support of the United Nations in October in her fight to free former Maldivian president Mohamed Nasheed, who was jailed for 13 years for terrorism in what she argues was an unfair trial. Clooney — and her husband — has also used her influence to draw attention to the plight of Syrian refugees. On the fifth year of the conflict, the couple released a video of them meeting three Syrians and Clooney described how she fled the violence in Lebanon in the 1980s. The couple also are helping Clinton become the first female US president by hosting two fundraising events planned for April. All that — and much more - while contending with tabloid gossip of her husband’s relationship with other women and whether she is pregnant. It would be a surprise if she had time to consider either. In only his second season in the English Premier League, the Algerian winger has become the new sensation everyone is talking about. His purposeful skills while in possession of the ball and nimble movements have been credited with taking Leicester City to the top of the table so far this season, with a convincing lead. 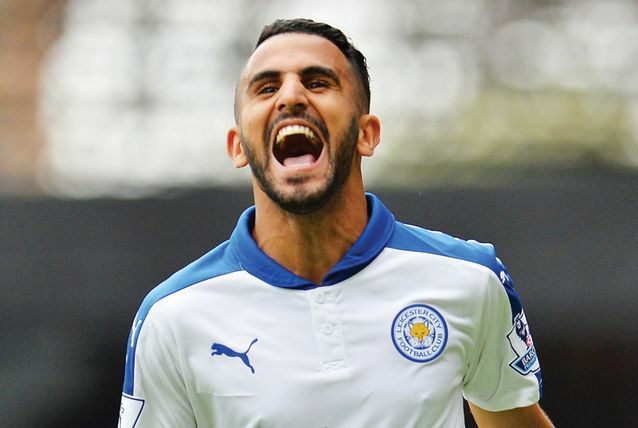 Mahrez was instrumental in returning the club to the Premier League for the first time in 10 years for the 2014-15 season after helping it to win the 2013-14 Football League Championship in his first few months with the club. Despite his thin stature that made some doubt him in his early days, Mahrez’s ability has seen him described by The Guardian as “one of the most exciting — and effective — players” in the league. He was born in France to an Algerian father — whose death in 2006 is said to have reinforced Mahrez’s determination to succeed in football — and Algerian-Moroccan mother. He kept strong ties to his homeland and in 2014 debuted for the national team at the FIFA World Cup and last year starred during the Africa Cup of Nations. He was named Algerian Footballer of the Year in 2015. Last year also saw him marry his English girlfriend. 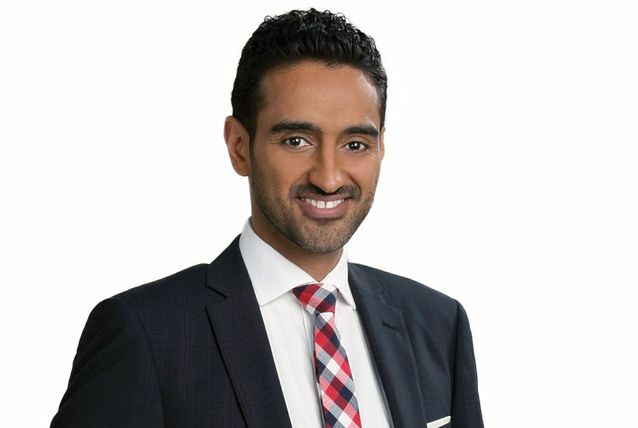 The Australian Sunni Muslim, who was born to Egyptian parents, is widely praised for his insightful commentary on Islam. Aly, who is a trained lawyer, first came to prominence a decade ago as the head of public affairs for the Islamic Council of Victoria. His frequent commentary in the media later led him to take up a fulltime career in the sector, co-hosting various television programmes and writing columns for the country’s top newspapers, often taking up various causes. He is now fulltime host of Network 10’s The Project, a nightly one-hour talk show. In November, Aly used his nightly editorial to present a powerful four-minute monologue outlining strategies to stop ISIL after the Paris attacks. He condemned current and former Australian politicians who he said had incited hate through their divisive comments and claimed the group was weak. “And they don’t want you to know it, which is why it’s something we should talk about,” he said. The video was viewed 13 million times on Facebook alone. However, Aly refuses to be on social media. He is also a lecturer at the Global Terrorism Research Centre at Monash University in Melbourne, where he lives with his wife and two children. As the founder of Injaz Egypt, El Mofty has impacted the lives of half-a-million Egyptian students through entrepreneurial and work readiness programmes. Based on the entrepreneurial educational organisation co-created by the late Soraya Salti, Injaz Egypt provides students with the real-life skills and experience of running a start-up with the support of mentors. El Mofty has taken Injaz Egypt a step further and established an accelerator to support the best businesses among the students. More than 40 Injaz teams have now gone on to significantly elevate their businesses. El Mofty told Arabian Business in November that even before businesses are profitable, they are significantly boosting morale in a country that has endured economic and social upheaval for the better part of five years. “Many of the students graduate with a sense of hopelessness, [believing they] need wasta — to know someone — to help me get a job, but with this entrepreneurship culture instilled in them at this young age, the sky is their limit,” she said. El Mofty also serves on the US-Egypt Business Council and is the co-chair of the Women in Business Committee at the American Chamber of Commerce, and is a member of the Education and Entrepreneurship Committee. Prior to Injaz, she helped Save the Children expand in Egypt. 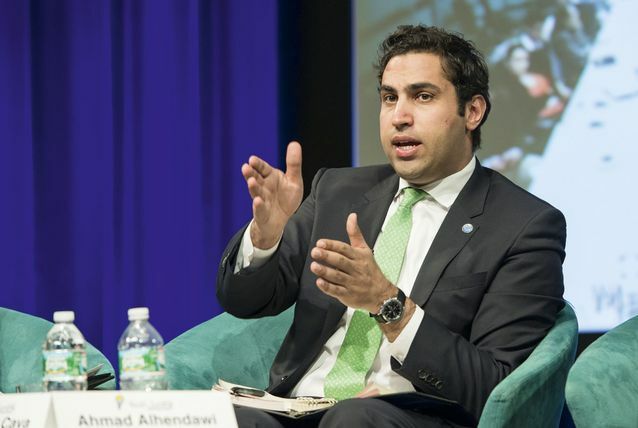 Alhendawi became the youngest ever senior official at the United Nations when he was appointed the first Envoy on Youth, working directly under secretary-general Ban Ki-moon, in January 2013. His mandate includes harmonising and enhancing the organisation’s response to youth issues, as well as youth involvement, and to advocate the development of their needs and rights. The Envoy on Youth also acts as the advisor to and the representative of the Secretary-General on youth-related matters. With a Master’s Degree in Advanced European and International Relations and a Bachelor’s Degree in Computer Information Systems, Alhendawi has spent the majority of his career advocating for youth. He was previously youth policy advisor to the League of Arab States and has worked on several major youth projects across the Middle East, as well as with non-government organisation Save the Children. 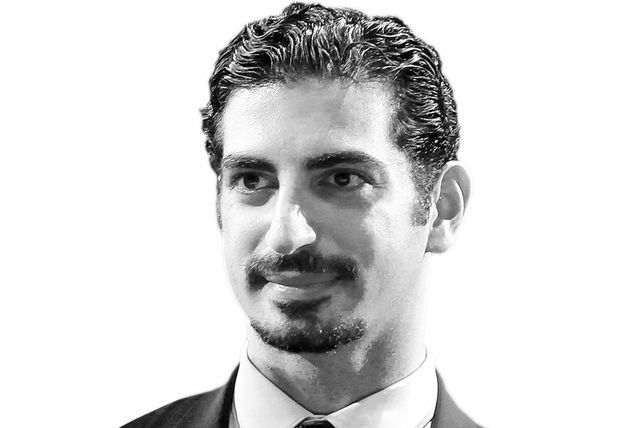 He co-founded the Youth for Democracy Network in Jordan and the International Youth Council, based in New York. In February, he made a speech to a UN youth forum challenging ten common misconceptions of youth, including that they are the ‘future’ rather than the ‘present’. He said it was imperative that youth have greater participation in decision-making processes at all levels. As the leader of the Middle East’s oldest private oil and gas firm, Crescent Petroleum, and the managing director of Dana Gas, Majid Jafar has become one of the region’s experts on the industry. The Sharjah-based firm has concentrated most of its exploration in Egypt and Iraq, where his family hails from, and particularly Kurdistan, where Crescent Petroleum has invested $1bn. He is also vice-chairman of the Crescent Group, the holding company founded by his father and which has interests in transport, logistics, private equity and property. Despite a financial impact on his businesses, Jafar has described the downturn in the oil price as an opportunity for the region to be more efficient and instigate fundamental energy reforms, particularly related to energy subsidies. A regular commentator, Jafar also advocates addressing Arab youth unemployment through investment and is the vice-chairman of the World Economic Forum’s Global Agenda Council on Youth Unemployment and the founder of the “Arab Stabilisation Plan”, which focuses on job creation through critical infrastructure investments to achieve economic stability. He is also vice-chairman of the Global Energy Initiative, a non-government organisation based in New York that is focused on sustainable development through tackling climate change and energy poverty across the world. As the first ever female to join the board of an Arab bank and the founder of social enterprise Khayarat, Najla Al Midfa has not only broken through her own potential barriers but has helped others to do the same. Khayarat is an online career development platform that gives young Emiratis advice when making career choices, particularly guiding them in the private sector, helping to bridge the gap between companies and high potential Emirati talent. Al Midfa has previously said she was inspired to set-up the service during her time as a senior manager at the Khalifa Fund for Enterprise Development, where she supported entrepreneurs. 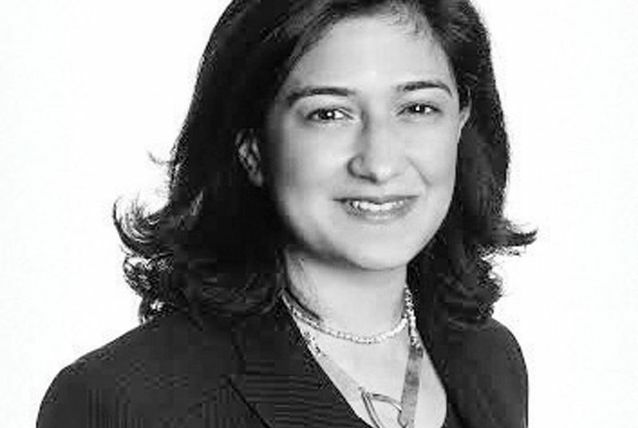 She has also worked for powerhouses PwC, Shell, Google and McKinsey & Company. 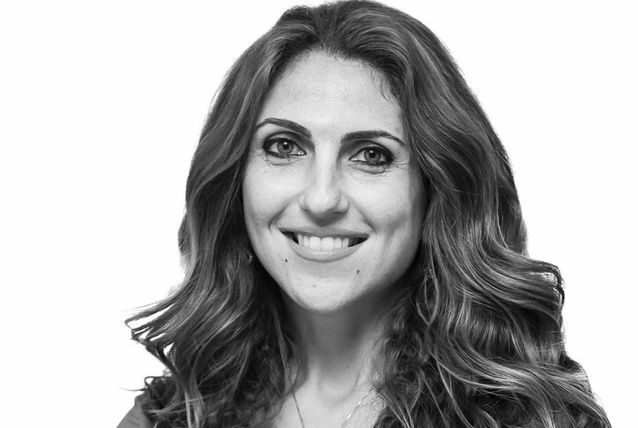 Al Midfa is a board member of Sharjah Business Women Council, vice-chairwomen of the Young Arab Leaders (UAE Chapter) and a member of the Aspen Institute’s Global Leadership Network and has a bachelor’s degree from the University of Bath and an MBA from Stanford University. 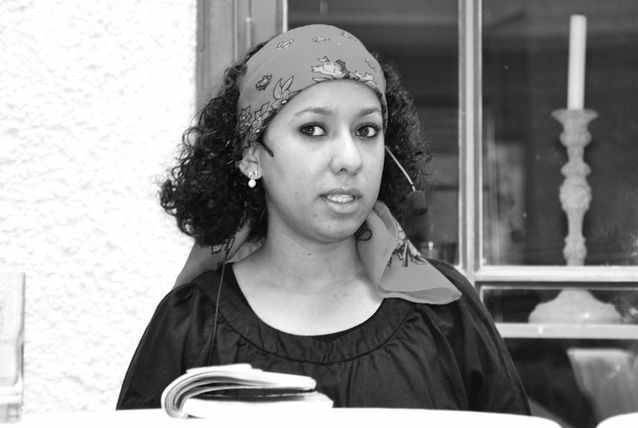 Rajaa Al Sanea became a face for feminism in Saudi Arabia when her book Girls of Riyadh attracted international attention after its publication in Lebanon in 2005. The unconventional story of four girls living in the highly conservative Islamic society has been so popular it was translated into English in 2007 and several other languages, although it was banned in the kingdom because it “incited vices” and subverted the foundations of Saudi literary tradition. These days Al Sanea is a practising dentist, following in the footsteps of many members of her family who are physicians of various kinds, but she is forever facing questions about the novel and being called on as a spokesperson for the rights of women. She told Washington-based radio network NPR last year that there had been some progress on women’s rights in Saudi Arabia, such as greater access to educational opportunities that had allowed her to study in the US. But many injustices remained, including a ban on women driving. However, Al Sanea said the country’s conservatives would always argue against change, no matter what it was, to begin with before accepting it. She expects women will be allowed to drive “sooner or later”. As a child, Naji Abou Nawar was fascinated by his father’s stories about Bedouins who lived in the Arab desert. Two decades later, he brought some of the tales to life in the award-winning film ‘Theeb’, which literally starred real desert dwellers. The movie, filmed in his native Jordan and released in 2014, tells the story of a young Bedouin boy in the Ottoman province of Hijaz during World War I, who guides a British officer to his secret destination. Nowar, who describes ‘Theeb’ as a “Bedouin western”, and screenwriter Bassel Ghandour lived for a year in Wadi Rum and Wadi Arabeh in Jordan’s south to better understanding the way of life. The captivating and personal film received widespread critical acclaim, including a Best Foreign Language Film nomination at the 88th Academy Awards, the BAFTA Award for Outstanding Debut by a British Writer, Director or Producer and the Director Prize at the 2014 Venice Horizons, and became the first Jordanian film to receive an Oscar nomination. Nawar was born in England to Jordanian parents and the family moved to Jordan when he was ten years old. He returned to England to complete school but again moved back to Jordan in 2004, where he remains based. He has dual citizenship. Nawar’s other works include ‘Death of a Boxer’ (2009), which screened at the Dubai International Film Festival, and ‘Till Death’ (2012). 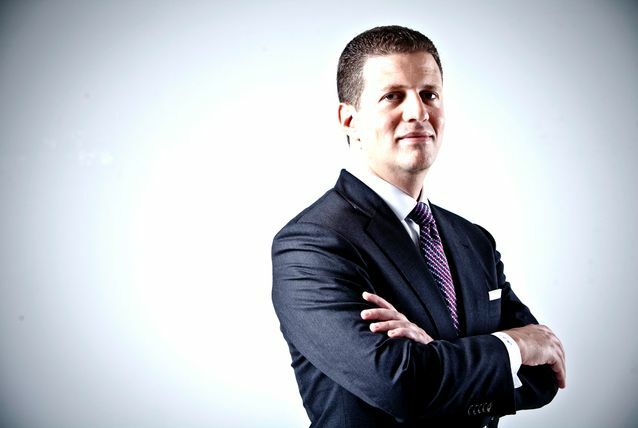 Rafi Demirjian represents more than 600 executives across the Arab world as the chairman of the Young Presidents’ Organisation (YPO) in the Middle East and North Africa. The global body, founded in 1950 and now present in 130 countries, provides members with access to educational and networking experiences designed to support their business, community and personal leadership. Members have all achieved success by the age of 45 and Demirjian is no different. He broke away from the family steel distribution business in 2007 to set up his own firm, Demirjian Global, which has become one of the largest steel trading companies in the region at the exact time that others were suffering amid regional and global economic downturns. His business has grown internationally, with operations in North Africa, the Levant, the Commonwealth of Independent States (CIS), China and Europe. He credits YPO with inspiring and empowering him to establish his own business. In his new position, his attention will be on providing opportunities for fellow businessmen to share and enhance their ideas and success. Demirjian told YPO in a recent interview that he was proud to help fellow YPO members, from as far as Pakistan to Tunisia, to create positive change and employment opportunities, particularly in an expanding youth population. 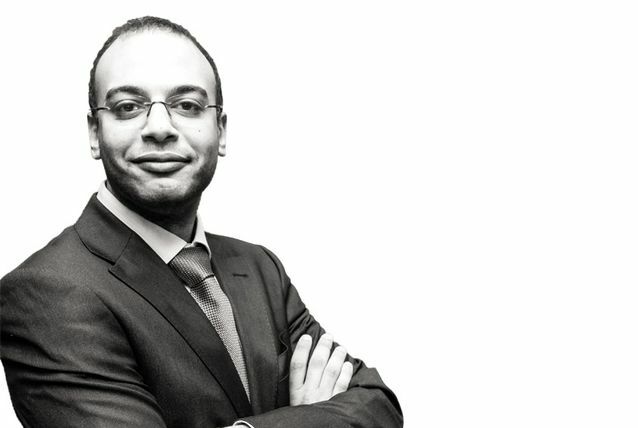 Hossam Bahgat has been writing investigative reports in English and Arabic for online journal Mada Masr for several years and was founding executive director of the Egyptian Initiative for Personal Rights, a Cairo-based human rights organisation, between 2002 and 2013. His reports and activism had always caused a stir in Egypt, but in November, Bahgat was arrested and detained by Egypt’s military intelligence agency in connection with articles he wrote describing criminal convictions against 26 military officers for plotting a coup. The military deemed them to be a threat to its security. Activists including Amnesty International argued it was a “flagrant violation of his right to freedom of expression”. Bahgat was released after two days, hours before planned protests calling for his release. Undeterred, as Egypt prepared for the fifth anniversary of the 2011 revolution in January, Bahgat told The Guardian that the scale of state repression in Egypt is greater today than it has been for generations, citing restrictions on media, an increase in the number of political prisoners, forced disappearances, and alleged extrajudicial killings of Islamists by the state. Bahgat also has served on the boards of the International Network for Economic, Social and Cultural Rights and the Fund for Global Human Rights. 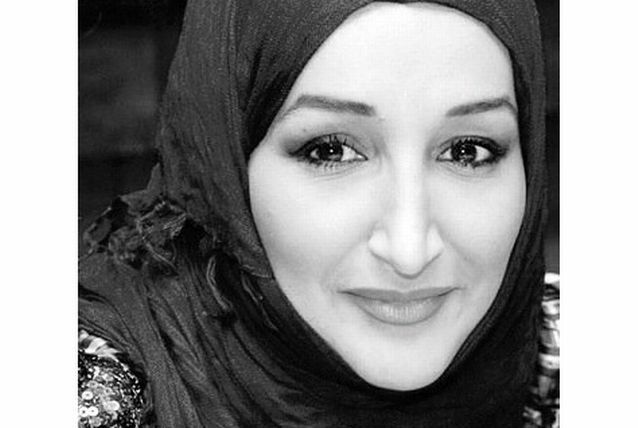 Afrah Nasser launched her journalism career while still studying at Sana’a University in Yemen, contributing to two national newspapers. 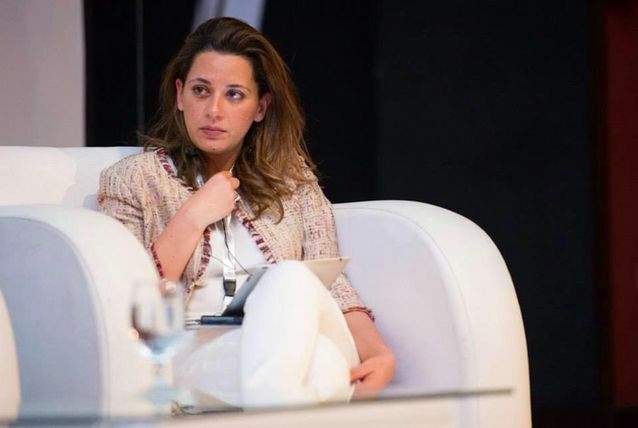 But when the so-called Arab Spring arose in 2011, Nasser, who was by now well awake to the unequal state of the world around her, relinquished her objectivity and began blogging. 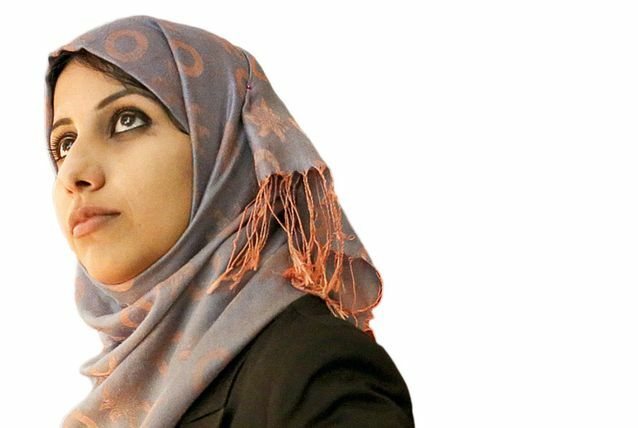 Her commentary on Yemeni politics, women’s rights and democracy soon forced her into exile and she has been a political refugee in Sweden since May 2012. From the relative safety of her new home, Nasser has continued to draw attention to the human rights abuses in her homeland, writing on her eponymous blog, organising events and occasionally running workshops. She deliberately writes in English, referring to her blog as “a megaphone to the world”. She has contributed to media outlets including Al Jazeera English, CNN, The National, Al Arabi magazine, Institute for War and Peace Reporting, the Doha Center for Free Media and Swedish International Radio. Her blog has been ranked among the best in the Middle East by numerous organisations and in 2014, she won the Dawit Issak Prize, which recognises those who fight for freedom of expression. 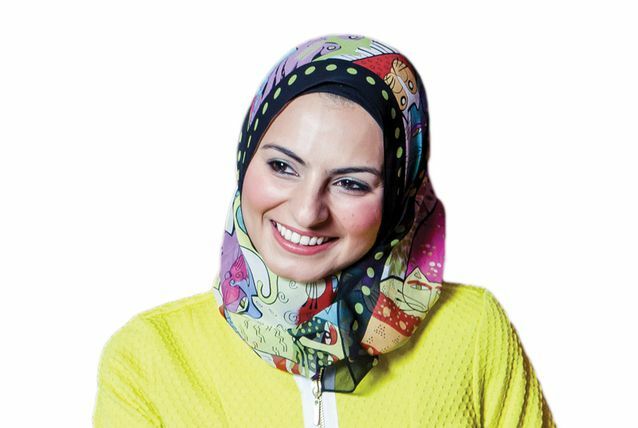 Through the Yemeni Salon Organisation that she and colleague Hana Al Khamri founded in 2012, Nasser has helped to empower the ever-growing Yemeni diaspora by organising cultural and media empowerment projects. 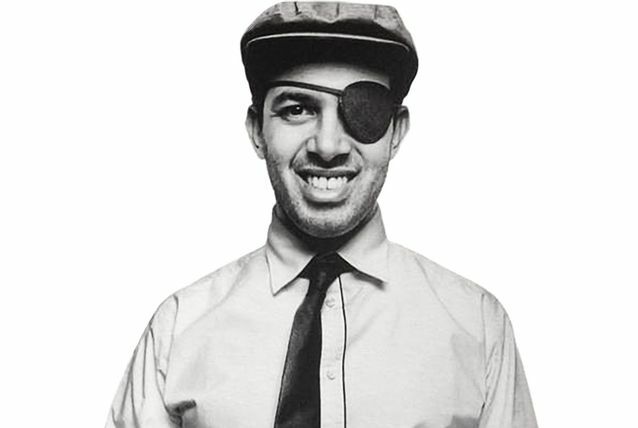 Jawad Nabulsi paid a significant price when he stood up to the Hosni Mubarak regime in Egypt in 2011, taking a gunshot wound to the eye. But as soon as he was well and despite wearing a permanent black eye patch, rather than hide, he used his entrepreneurial skills to launch the Nebny Foundation, which immediately provided medical assistance to 2,200 people during the first uprising. He turned down a post-revolution offer to become Minister of Youth and instead dedicated his time to providing Cairo’s slum poor with education, medical assistance, micro-loans and business advice. His work has had such a great impact, the World Bank chose the foundation from among 40,000 Middle East non-government organisations to become one of its donor recipients. Jawad also received the 2011 Khalil Gibran Spirit of Humanity Award. Now living in the US, Nabulsi has spent the past two years improving his own education, completing a Master’s Degree in Public Administration at the John F Kennedy School of Government at Harvard University in mid-2015. Shortly before graduating, he co-authored an article with fellow members of the Harvard Muslim Society, titled ‘A Call for Tolerance and Understanding’ following the massacre of three Muslim students in Chapel Hill. “As Muslims in America, we feel that the average American, and even the average Harvard student, knows very little about who we are, where we come from, and what we stand for,” the co-authors said. He is now studying a Master’s in Management at the Stanford Graduate School of Business, while continuing to run the Nebny Foundation. Renewable energy has increasingly become a focal point for the UAE government, making Dr Thani Al Zeyoudi’s appointment in February as the Minister for Climate Change and Environment all the more significant. He has been director of the Office of Energy & Climate Change at the Ministry Of Foreign Affairs since 2010 and continues to hold multiple related positions, including as the UAE’s permanent representative to the UN’s International Renewable Energy Agency (IRENA), representing the UAE at the Global Green Growth Institute, serving as the vice-chair and member of the Zayed Future Energy Prize review committee, and as a member of the Environment Agency in Abu Dhabi. 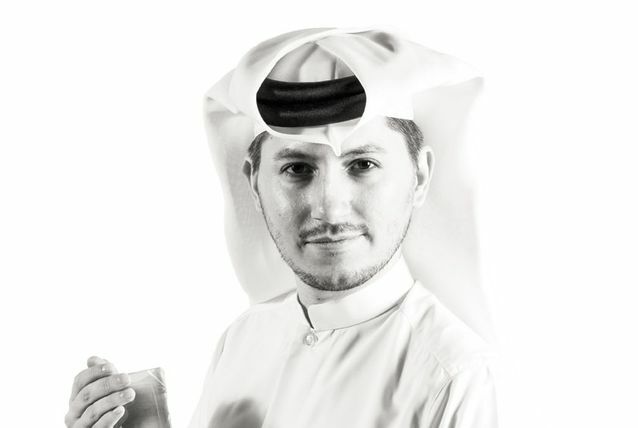 He previously worked at Masdar, Abu Dhabi’s initiative advancing renewable energy technologies and solutions. 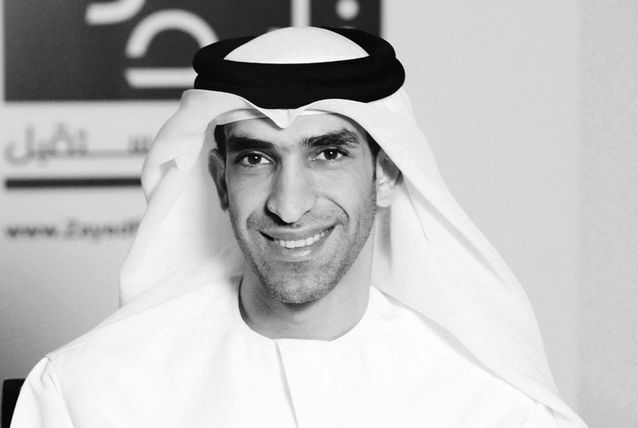 A perennial student, Dr Al Zeyoudi has a PhD in Renewable Energy from SKEMA Business School in France, a Master’s Degree in Project Management from the British University in Dubai, an MBA from the New York Institute of Technology in Abu Dhabi, and a Bachelor of Science Degree in Petroleum Engineering from the University of Tulsa, USA. Mohamed El Dahshan is a regional economist at the African Development Bank, helping to establish links between the bank and private sector partners to further Africa’s development goals. 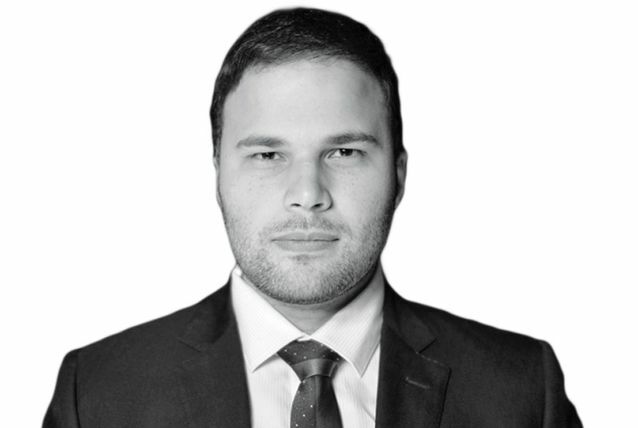 He is also a non-resident Fellow with the Tahrir Institute for Middle East Policy in Washington, DC, and a professor of development economics at Cairo’s Ain-Shams University. The Harvard Kennedy School of Government graduate specialises in private sector development and investment promotion and entrepreneurship, particularly in post-conflict countries. He has worked for the Center for International Development at Harvard University, and consulted for international organisations including UNDP, the World Bank, IDRC and UNIDO, as well as for the governments of Palestine and Dubai, and various think tanks and research centres. El Dahshan is also an activist and has received applause for his writings on both economic development and Egyptian politics, with articles published in media including The Guardian, Huffington Post, Foreign Policy magazine’s Transitions blog, The New York Times, The New Yorker, and on his eponymously titled blog. His coverage and analysis of the 2011 Egyptian revolution earned him the Anna Lindh Euro-Mediterranean Journalism Award for traditional and social media. He also co-author “Diaries of the Revolution”, a collective memoir of the uprising. El Dahshan remains based in Cairo but travels extensively, often for speaking engagements. 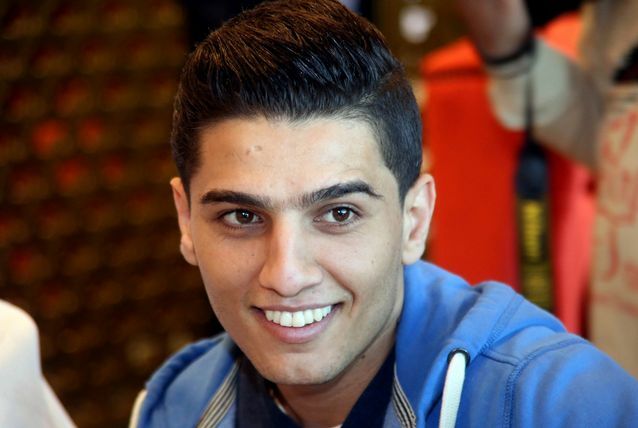 The winner of the second season of the television pop contest Arab Idol, Mohammed Assaf’s Palestinian cause and resemblance to revered Egyptian singer Abdel Halim Hafez, has garnered him a strong following across the Arab World. Born in Libya, he was four years old when his family returned to the Gaza Strip and lived in Khan Younis refugee camp. Despite his surroundings, his stunning voice was recognised as young as five and he was still a pre-teen when he first sang in public, on a popular local television programme, and later began performing professionally at weddings. 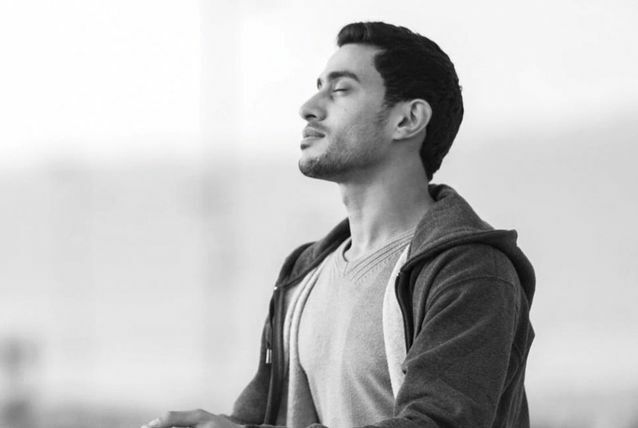 His arduous journey to reach the Arab Idol trials in Cairo is well-known: he travelled for two days by car before being locked out because he was late. Having jumped a wall, it was only the selflessness of a fellow Palestinian contestant who gave up his position to Assaf that saw him selected for the show. Since winning, Assaf has not deliberately sought to politicise his fame but he has been described as having the ability to unite Palestinians in a way that political factions have not been able to. 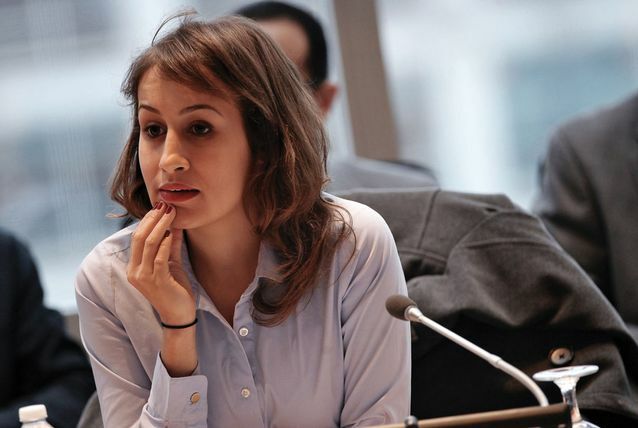 Having been raised by a father who spoke out about the lack of justice in Tunisia and experiencing the death of her equally outspoken cousin in 2005, Amira Yahyaoui was unafraid to follow her own human rights activist path at a young age. She was still only a teenager when she was forced to flee to France where she was stateless until the downfall of former president Zine Al Abidine Ben Ali’s regime in 2011. That year Yahyaoui returned to her homeland and founded the non-profit, non-government organisation Al Bawsala. The organisation is strictly independent from political influence and works to hold the Tunisian government to account, but also to enhance relationships between elected representatives and the public and thereby help avoid another revolt. The country’s peaceful transition to democracy indeed saw it named The Economist magazine’s country of the year in 2014. Her activism during and following the revolution saw her win a Vital Voices Global Trailblazer award for women transforming the Middle East. In 2014 she became a Meredith Greenberg Yale World Fellow and was awarded the Prize for Conflict Prevention by the Fondation Chirac, established by former French president Jacques Chirac. The 23-year-old college dropout and serial social entrepreneur is aiming to make the Arab world a hub for innovation. Having started six of his own digital companies, he now also advises other start-ups and wannabe entrepreneurs on how to break through to success. Based in the creative environment of Beirut, Absi is a common fixture at nearly all entrepreneurial events in the capital, including his own weekly gatherings through the eClub, which he founded to provide fellow entrepreneurs in Lebanon an opportunity to discuss issues and learn from each other, not to mention network. 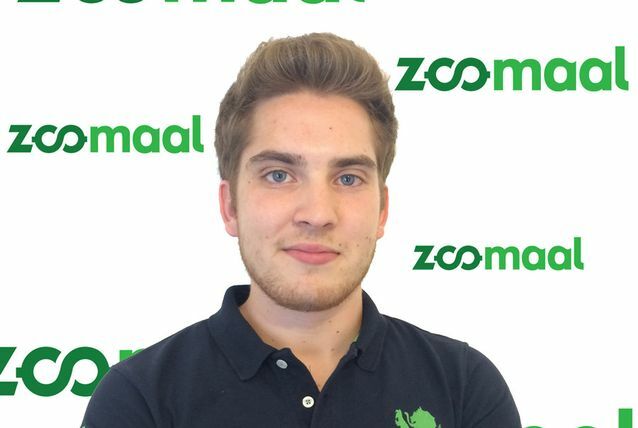 His most well-known business is perhaps Zoomaal, a leading crowdfunding platform that supports creativity in the Arab world and is funded by four major institutional investors. Others include Rifflex, Askolar, CrowdVolt.com, YallaSMSme, TimeToSMS and LebAutos. But we will be hearing a lot more from Absi — he says he has at least 70 other ideas, from mobile apps to disruptive knowledge sharing platforms, “baking”. Absi has won more than ten awards in entrepreneurship and computer science and in 2014 was recognised as a World Economic Forum ‘Global Shaper’. “Nothing makes me happier than motivating and empowering people to become entrepreneurs and start their own businesses,” he says. 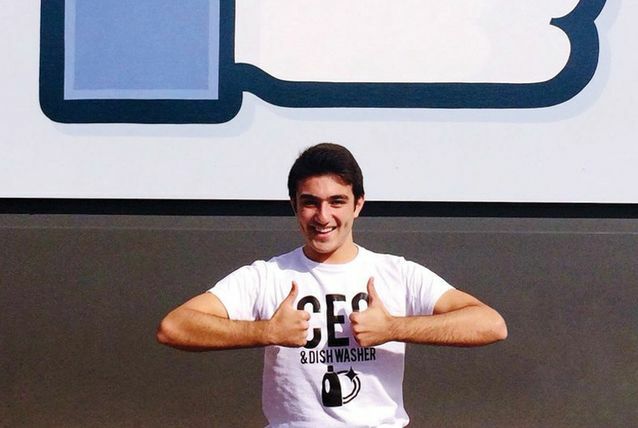 Amine Raghib is one of a growing number of young Arabs taking to social media to document their interests, activities and expertise to the world. From Marrakesh in Morocco, Raghib started his YouTube channel Al-Muhtarif (which means ‘Arabic for the professional’), five years ago and it now has 1.3 million subscribers. 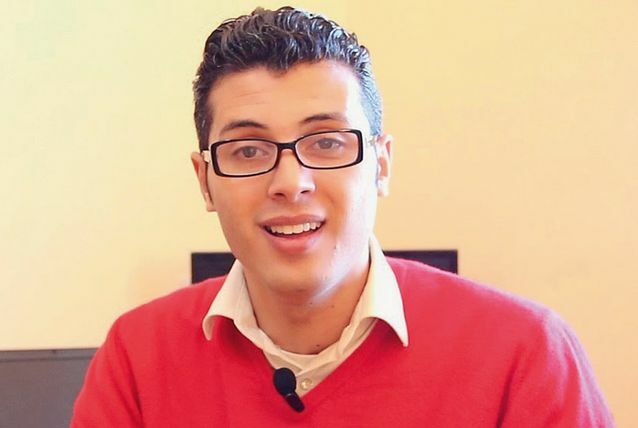 In 2014 he became the first Moroccan to win a YouTube ‘Silver’ Award, handed to content creators on the platform who reach 100,000 subscribers. At the time he had more than 365,000 subscribers — the next award is ‘Gold’ when creators reach one million subscribers. Raghib told local media: “I am a very simple person. I started from zero. What I want to tell you is to hold on to your dreams. Do not make excuses.” He has been awarded a ‘best blogger’ prize in Morocco and participated in several technology competitions across the Arab world, including one organised by the Universal Center for Journalists in Morocco. He has also appeared on sevelocal TV shows to discuss his work. Badr Al Olama is CEO of Strata Manufacturing, Mubadala Aerospace’s advanced aero-structures manufacturing facility in Al Ain. 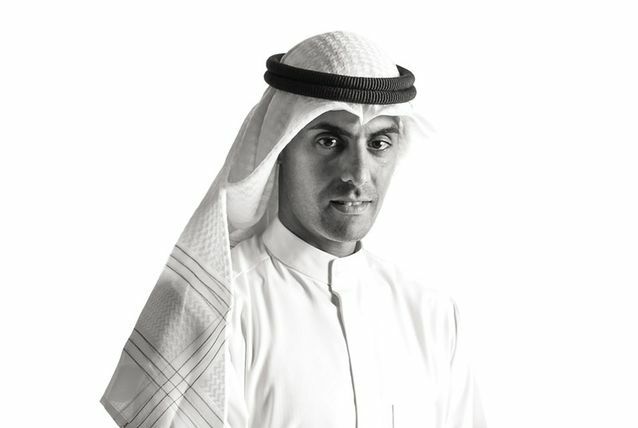 Since his appointment in 2012, he has led the development of the Nibras Al Ain Aerospace Park, a joint initiative between Mubadala Aerospace and Abu Dhabi Airports Company intended to house global aerospace firms’ regional operations and drive the knowledge economy as part of the Abu Dhabi Economic Vision 2030. He previously served as the company’s deputy CEO since April 2011. A graduate of Harvard Law School in the US and the College of Sharia and Law at the UAE University, Al Olama was a legal consultant at Habib Al Mulla & Co law firm — now Baker & McKenzie Habib Al Mulla — prior to joining Mubadala. 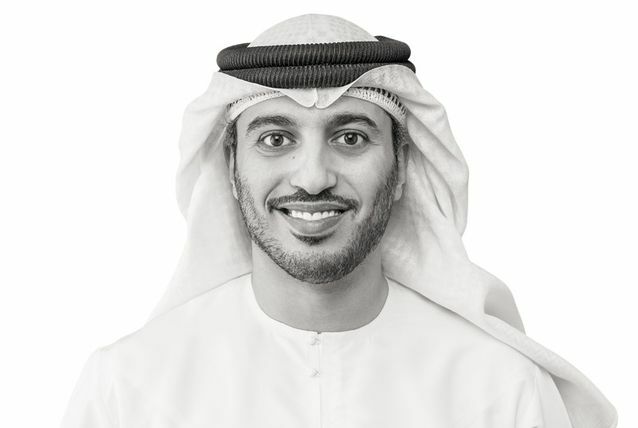 He serves on the board of directors at Sanad Aero Solutions, another Mubadala Aerospace company, and is president of the UAE Harvard Alumni Society. Al Olama also serves as chairman of regional children’s development charity Bidayaat, which runs social, cultural and educational programmes in association with partners. He is also a member of the World Economic Forum’s Global Agenda Council on the Future of Manufacturing. A graduate of the American University in Cairo, Minoush Abdel-Meguid later received an Executive Diploma in Mergers and Acquisitions from the Aresty Institute of Executive Education at the Wharton School, University of Pennsylvania. She has had more than 17 years of experience in investment banking and investment management and is currently CEO, chief investment officer, and managing director of Union Capital, a fund for small-to-medium-sized businesses (SMEs) in Egypt. 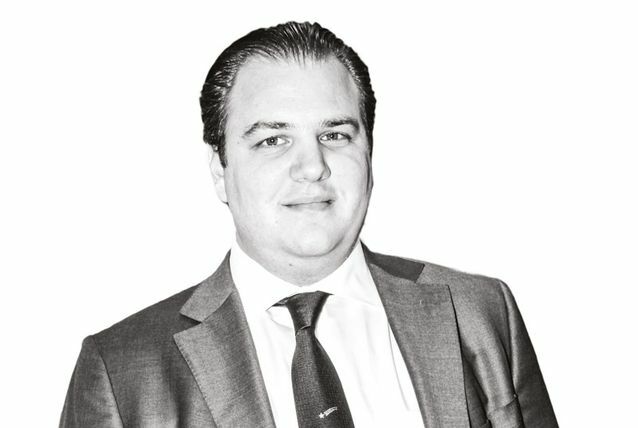 Before setting up Union Capital, Abdel-Meguid worked in various investment banking roles, including as a financial analyst at Goldman Sachs in London, and as a manager at HSBC Investment Bank Egypt. She also served as head of corporate finance at Egypt’s Capital Market Authority between 2005 and 2007, during which time she was part of the team leading the introduction of a new takeover chapter. Last year she was selected as Young Global Leader for 2015 by the World Economic Forum. Abdel-Meguid is founding president of the Egyptian Young Bankers Association, an Egyptian NGO that supports the careers of young bankers. Over the course of the last year, Abdel-Meguid co-led Union Capital’s exit of its stake in Sinai Marble Company and was selected as a Young Achiever of the Year by the Global Leadership Congress. California-born Ahmed Shihab-Eldin holds a master of science in journalism from Columbia University Graduate School of Journalism and still works as an adjunct professor for the institution, teaching digital media. 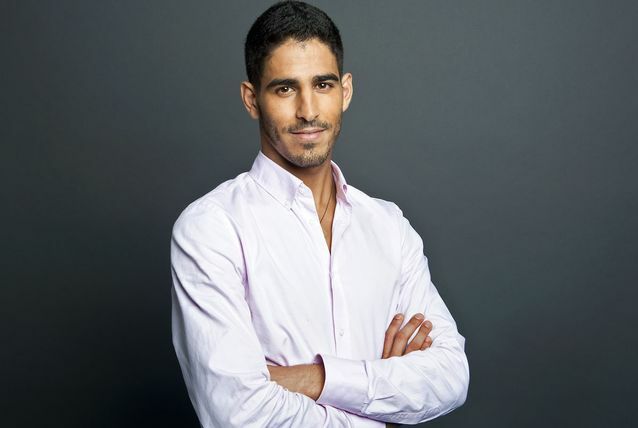 Of Palestinian descent and with Kuwaiti parents, he is a lifelong expat, having been raised in Kuwait, Egypt, the US and Austria. 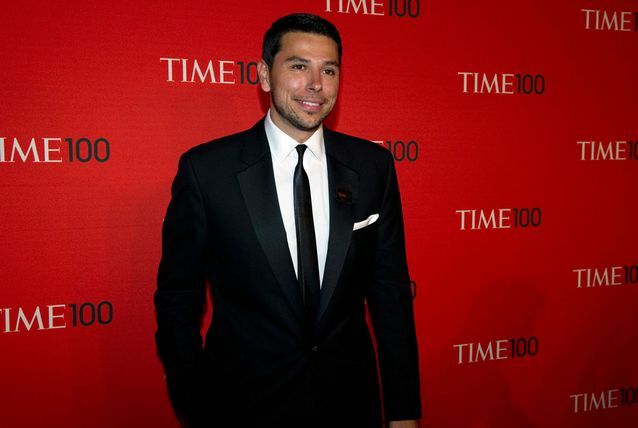 He started his journalism career in the US as a news producer with the New York Times in 2008. He then worked at Qatar’s Al Jazeera English for six months. Also in Doha, he worked as a reporter and producer for the Doha Film Institute, during which time he helped launch the first Doha Tribeca Film Festival. 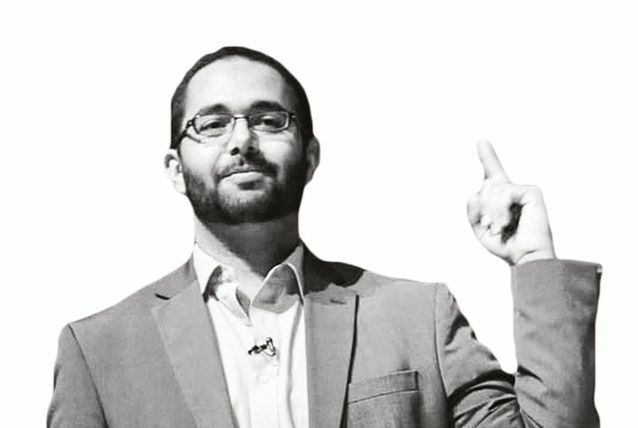 In 2011, Shihab-Eldin created, produced and co-hosted Al Jazeera English’s social media show ‘The Stream’, an interactive talk show that earned him an Emmy nomination for Most Innovative Program in 2012 for an episode about Bahrain’s political crisis. He has also blogged for the Huffington Post. His Master’s digital media project earned him a Webby Award for “Defining Middle Ground: The Next Generation of Muslim New Yorkers”. He is currently a correspondent and producer at VICE Media in the US. 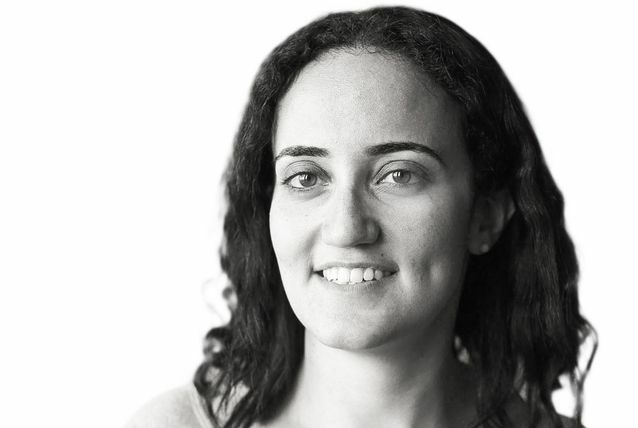 Radwa Rostom is a civil engineer with a focus on sustainable construction. She has worked as a business development manager at WeForest, an organisation that seeks to tackle climate change through planting trees, since last August. 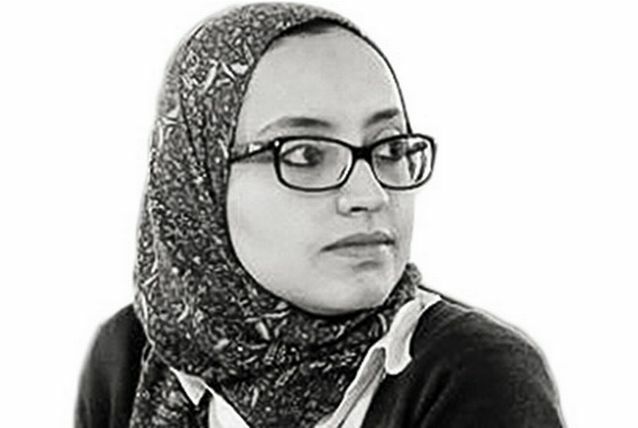 In her previous role as a training and CSR specialist at Egypt’s Solar Energy Co, she worked with government, NGOs, donor agencies and international organisations to implement the company’s social development projects, in particular, initiatives to address lack of housing for poor communities in Cairo. She is the founder of Hand Over, part of Egypt’s government-backed Ezbet Project that aims to improve education, housing and healthcare in Cairo slums. Hand Over works with architecture and civil engineering students, graduates and local residents to jointly design and build sustainable and affordable homes for slum dwellers. Rostom first began to develop the idea in January 2014 when she was granted a fellowship from The DO School in Hamburg, Germany. Since its inception, Hand Over has rebuilt a housing unit in the Abu-Qarn district with a team of 27 engineering students/graduates and a group of local residents. According to its website, the group used a technique called ‘rammed earth’, which compresses a damp mixture of earth into a supported frame. Rostom plans to expand the model to all slum areas across Egypt. 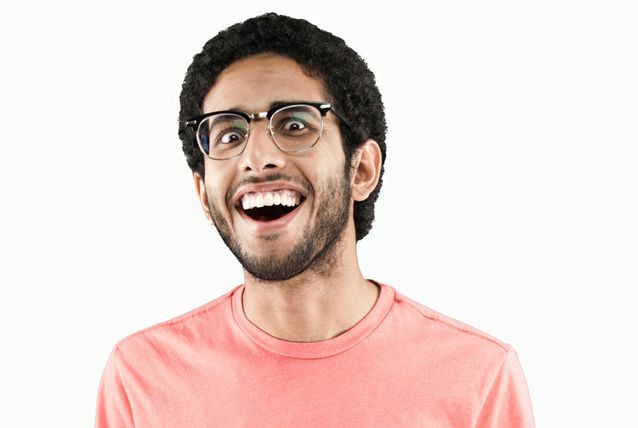 Thirty-one-year-old Bader Saleh is a stand-up comedian and host of the hit Arabic language YouTube show Eysh Elly. Since its inception in 2011 the channel has attracted more than 2.7 million subscribers and each fortnightly episode regularly receives more than 1 million views. Each ten-minute show is a mix of skits and segments poking fun at other YouTube clips, and Saleh has been quoted as saying its success is down to its ‘good, clean fun’. He has maintained his stand-up career, however, performing at shows across the region including at du Forum on Yas Island, last year as part of Abu Dhabi Summer Season. He has 2.2 million Twitter followers. Tourism continues to be a significant driver of the UAE economy and government bodies and businesses are taking steps to expand the sector further. 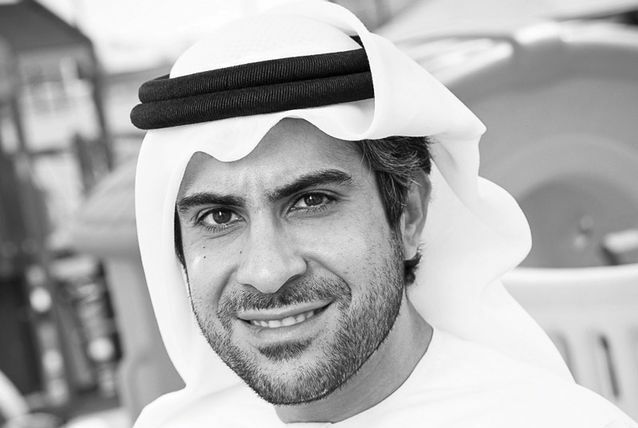 Emirati Issam Abdul Rahim Kazim is the CEO of Dubai Corporation for Tourism and Commerce Marketing (DCTCM), which is responsible for branding and marketing Dubai to the world. He took up the post in 2014 after serving as director of DXB Live, a subsidiary of the Dubai World Trade Centre. In that role, he was responsible for creating and developing strategic live events such as Dubai Sports World, Dubai Music Week and Dubai Classics. Before that, he worked at Dubai real estate developer Nakheel and Dubai Bank. At DCTCM, Kazim works to increase the organisation’s work with private and public sector tourism and commerce partners to promote Dubai’s reputation as a major international business and leisure destination. The emirate has set itself a target to attract 20 million visitors each year by 2020, and Kazim is responsible for devising and implementing new activities to achieve this. Last year he was reportedly planning to set up more tourist information centres – which at present are only located at Dubai Airport and Dubai Cruise Terminal. An established figure on the Arab pop and celebrity scene, Lebanese singer Nancy Ajram began performing as a child and released her first studio album when she was just 15. Her career breakthrough came in 2002, when she collaborated with the producer Jiji Lamara for the first time to release the hit track ‘Akhasmak Ah’ on her third studio album ‘Ya Salam’ in 2002. She released her second international bestselling album ‘Ah W Noss’ in 2004, cementing her status as an Arab pop icon. In 2009 she was even described by Oprah Winfrey as ‘the Britney Spears of the Middle East’. Successive albums include‘Ya Tabtab...Wa Dallaa’ (2006) and ‘Shakhbat Shakhabit’ (2007), while ‘Betfakkar Fi Eih? !’ (2008) won Ajram her first World Music Award for the World’s Best-Selling Middle Eastern Artist. She has since won a string of other awards, including the Murex d’or Award. In January 2015 she released her newest single, El Masri Man. She is well known for her glamorous, high-budget promotional videos. Ajram is also the first and only female to be sponsored by and a spokesperson for Coca-Cola in the Middle East, and last year was appointed as Chinese technology giant Huawei’s brand ambassador for its Ascend Mate 7 smartphone. She has two daughters with her dentist husband. Since its inception five years ago, Jassim Alseddiqi’s Abu Dhabi Financial Group (ADFG) has built up an investment portfolio worth at least $1.5bn in assets. In particular, it is making high profile acquisitions in London, including No.1 Palace Street and New Scotland Yard, for which it announced redevelopment plans in February. It also has ambitious plans to expand in Eastern Europe and is currently working to build up a land bank on the Black Sea in Bulgaria, as well as other sites in Serbia and Montenegro. Over the last years, the company has evolved and expanded into an integrated financial services platform under the umbrella of ADFG, branching out into real estate investments and debt structuring and management. Alseddiqi is also the chairman of Integrated Capital and First Gulf Financial Services, as well as being a board member at First Gulf Bank, Tourism and Development Investment Company, Qannas Investments, Northacre Plc and Abu Dhabi Capital Group. He holds a degree in electrical engineering from the University of Wisconsin Madison, and earned a master’s in the same subject from Cornell University in the US. Hosam Zowawi is a clinical microbiologist specialising in antibiotic-resistant bacterial diseases — so-called “superbugs”. He is part-way through his PhD studies at the University of Queensland’s Centre for Clinical Research in Brisbane, analysing bacteria sourced from the GCC to identify the predominate genotype spread in GCC hospitals, and promote the importance of ongoing surveillance of multidrug-resistant organisms across the Gulf. Although he now lives in Australia, the 31-year-old was born in Saudi Arabia, and his PhD is funded by several Gulf organisations including Kuwait University, the King Saud Bin Abdul Aziz University for Health Science and Oman’s Royal Hospital. As part of his studies, Zowawi developed a fast diagnostic tool called “Rapid Superbug” that identifies an infection more quickly. He describes himself on his Twitter profile as “a superbug fighter and polo player”, and adds that he is “the son of noble parents, husband of the most supportive and intelligent queen, and father of a clever princess”. 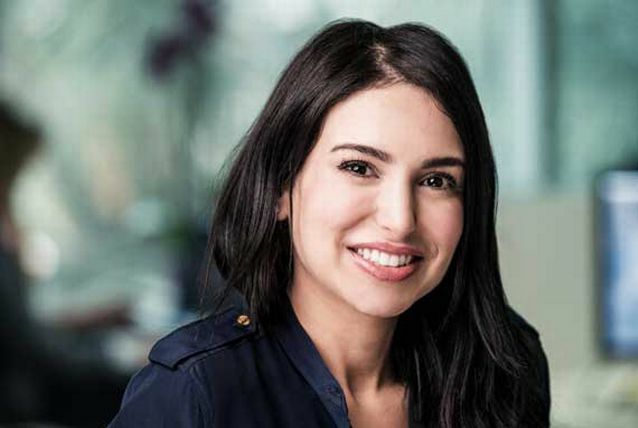 Ghosson Al Khaled is the chief operating officer of industrial and construction services group ACICO, having worked her way up the ladder over the years. ACICO started off as an industrial company specialised in autoclaved aerated concrete in 1990, and is now a large conglomerate comprising several different businesses: ACICO Industrial, ACICO Construction, ACICO Cement, ACICO Real Estate and ACICO Real Estate — Hotels. The company is listed on both the Kuwait and Dubai financial markets and is currently engaged in a diverse range of projects including the National Autism Centre and Fish Market developments in Kuwait, and the Radisson Royal hotel and Nassima Tower in Dubai. Despite having an engineering degree from the Kuwait University School of Civil Engineering, Al Khaled was determined to increase her management skills, so she completed a Master’s Degree in Building Science from the University of Southern California. 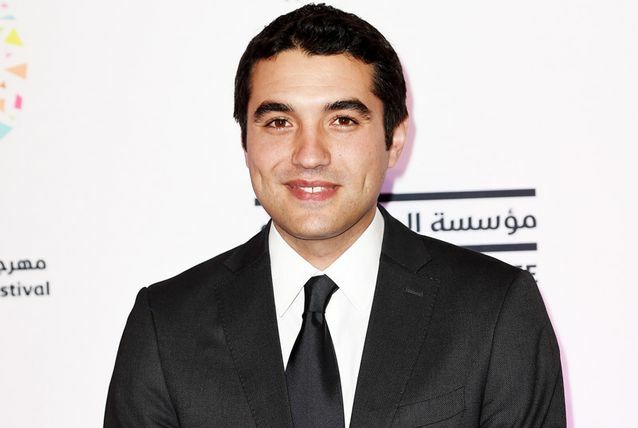 Egyptian-American journalist Ayman Mohyeldin is a Los Angeles-based foreign correspondent and news anchor for NBC News. He previously worked for Al Jazeera and CNN, and was reportedly one of the first Western journalists permitted to report on the trial of the deposed former president of Iraq, Saddam Hussein. Mohyeldin was born in Cairo to an Egyptian father and Palestinian mother and grew up in Egypt until his parents emigrated to the US when he was five years old. He studied at the American University in Washington, DC, earning a Bachelor’s in International Relations and later a Master’s in International Politics with a focus on peace and conflict resolution. His graduate thesis, entitled ‘The News Media Paradigm in the War on Terrorism,’ was accepted by the International Association of Media Researcher’s Conference in Barcelona, Spain, in 2002. He began his journalism career at NBC, working as a desk assistant in the Washington, DC bureau. He then moved to Iraq and worked as a foreign news producer with CNN from 2003 to 2005. He later covered the 2011 Egyptian revolution and Arab Spring protests for Al Jazeera English. More recently, Mohyeldin has become the host of digital show ‘Road Map’ on Shift, and is a self-proclaimed keen foodie and photographer. Talal Al Gaddah is CEO of MAG Property Developments, part of the UAE’s well established MAG Group formed by his father, group chairman Moafaq Al Gaddah, three decades ago in 1978. Since then, the group has evolved to become a large multinational with 50 companies covering almost every country in the world, 2,000 staff and activities spanning commercial, real estate, service and industrial. Al Gaddah junior heads up MAG Property Development. He has been reported as saying he wants the company to become one of the top five developers in the UAE, and ultimately expand to locations including the Far East, the US and Europe. It has already completed a series of high-rise towers and hotel apartments and plans more projects in Downtown Dubai, Jumeirah Lakes Towers and Sharjah. Al Ghaddah is also involved in Mag Group’s new affordable business, MAG 5 PD — a joint venture between MAG Property Developments and the holding company. 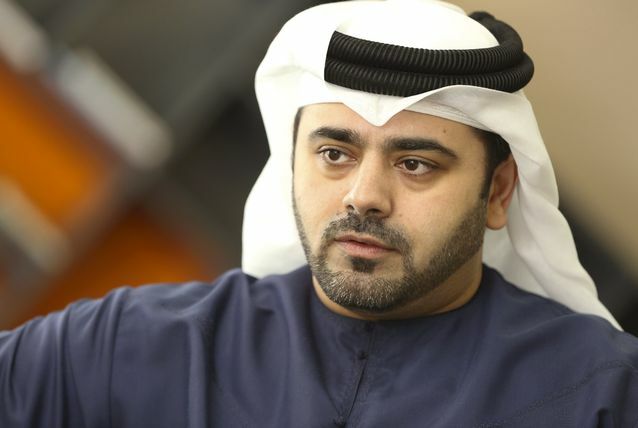 Al Ghaddah told the construction press last August the division had been set up to cater to the growing number of expats in Dubai “who are choosing to put roots down in the city and wish to purchase property as homes first [and] foremost and not just assets to turn a profit”. Last year it launched MAG 5 Boulevard, an affordable housing community in Dubai. Palestinian by descent, rising fashion model and reality TV star Gigi Hadid (born Jelena Noura Hadid) was born in Los Angeles, California. Her mother, Yolanda Foster, was also a model and her father Mohammed Hadid is from Palestine. As a teenager she appeared in several episodes of ‘The Real Housewives of Beverly Hills’ and in 2011 signed with the IMG Models agency. After graduating from Malibu High School in 2013, she moved to New York and began her modelling career. Hadid became the face of Guess in 2012 — she reportedly first appeared in a Guess campaign when she was just two years old — and made her catwalk debut at New York Fashion Week in 2014. Since then she has appeared on numerous magazine covers and in pop music videos, and is fast becoming a household name. She is also an influential social media sensation, and has 1.75 million followers on Twitter. 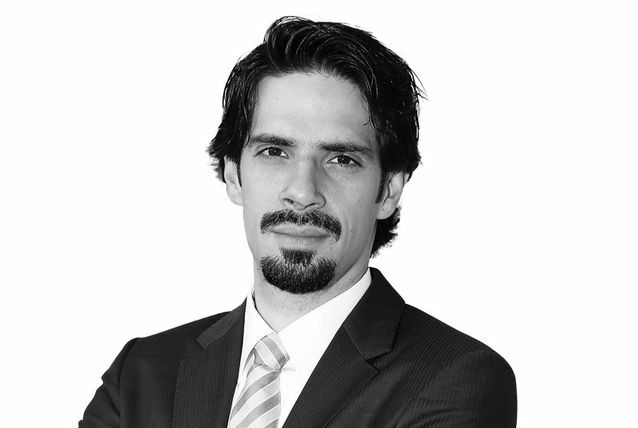 Hisham Samawi first visited Dubai in 2002 while he was studying for an MBA at Columbia University in New York. He returned to the city to set up home in 2006, determined to pursue business opportunities there. His first two years in Dubai were spent working in business development and strategy for Tatweer, a member of Dubai Holding. However, recognising an opportunity to develop the region’s art scene, he left Tatweer to set up the Ayyam Gallery, one of the region’s best-known arts organisations, with his cousin Khaled. The gallery first opened in Samawi’s home city of Damascus, Syria, in 2008. However, in 2011, he moved the gallery from Damascus to Dubai as the Arab Spring wreaked havoc across the Middle East. Remarkably, he also managed to persuade 15 artists and their families to move to the UAE. Ayyam Gallery has grown steadily over the years to include two spaces in Dubai, one in Beirut and its latest on New Bond Street in London. It represents many of the leading artists from around the Arab world and Iran. In addition to hosting exhibitions, the gallery holds a series of auctions called The Young Collectors Auction, and has a publishing house that produces a wide range of artists’ books and catalogues. Recognising another business opportunity, Samawi introduced one of his favourite New York eateries, Clinton Street Baking Company, to Dubai, opening its first location at Burj Views in 2014. The restaurant has established itself as Dubai’s go-to place for all-day breakfast and high quality casual dining. Having signed the master franchise for the MENA region, Samawi is looking to grow and develop the brand. Majid Al Ansari is an Emirati filmmaker who began his career as an intern at Image Nation Abu Dhabi, a media and entertainment company that produces Arabic language films, documentaries and TV series. 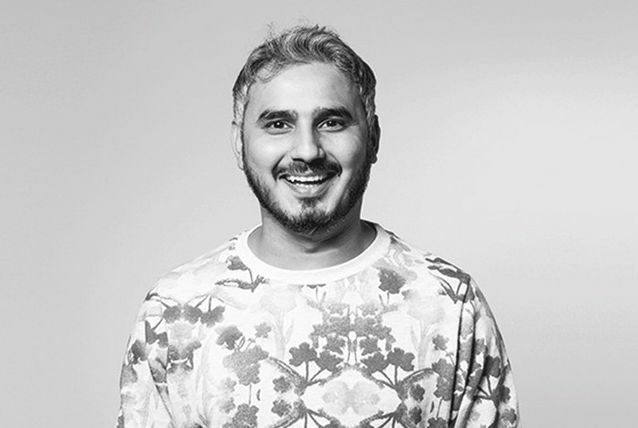 During his four years with the organisation, Al Ansari worked on several international and regional productions, including ‘From A to B’ and ‘Contagion’, and did a stint in the LA office of Image Nation’s partner Participant Media. He directed his first film in 2012, a short feature film called ‘The Intruder’, which premiered at Dubai International Film Festival (DIFF). ‘The Intruder’ received strong reviews and accolades including the Golden Palm for Best Short Film at the Mexico International Film Festival, an honourable mention at Boston’s Sci-fi Film Festival and an excellence award at the Puerto Rico Rincon Festival. Part of a family of social activists, Mona Seif grew up taking an early interest in many of the social issues facing her home country of Egypt. Her father is a human rights attorney who was imprisoned for five years, while her mother helped organise demonstrations against the Mubarak regime during the decades before his downfall. Her brother, Alaa Abd El Fattah, was imprisoned for 45 days for his blog Manalaa, through which he used to document abuses by the Mubarak regime. Following in her family’s footsteps, Seif became known for her participation in dissident movements during and after the 2011 Arab Spring. 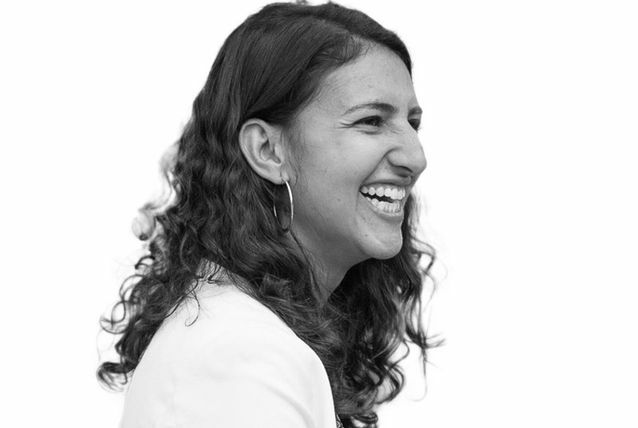 She co-founded the campaign, No to Military Trials for Civilians, which pushes for the release of those detained during the Egyptian revolution, and manages a blog called Tahrir Diaries — Diaries Under Military Rule. She also regularly writes on her blog Ma3t, requesting that people come forward with their own stories for publication. When not campaigning for human rights in Egypt, Seif is a biology graduate student investigating the BRCA1 breast cancer gene and its mutation pattern in Egyptian patients. Often dubbed ‘the Seinfeld of Saudi Arabia’, comedian Fahad Albutairi was one of the first stand-up comics to appear on stage professionally in the kingdom. He worked for some time at Saudi Aramco, but is now a full-time writer and comedian, having honed his craft as a student at the University of Texas, US, where he studied geophysics. He made his stand-up debut in Manama in 2008 but has since become a pioneer of Saudi’s ‘new media’ movement — using YouTube as his main distribution platform. Together with a team of fellow stand-up comedians including Ibraheem Alkhairallah, Albutairi has launched several YouTube shows, including ‘La Yekthar’, which loosely translates as ‘Zip it’. What started as ad-libbed monologues soon developed into scripted episodes that have garnered 40 million hits. The group also started shows such as ‘Khambalah’ and ‘Temsa7LY’, and also launched Telfaz11, a channel for distributing online entertainment content. In 2013, his YouTube video ‘No Woman, No Drive’ went viral with 12 million hits. It shows Albutairi and fellow comedians Hisham Fageeh and Alaa Wardi singing a parody of Bob Marley’s ‘No Woman, No Cry’ that satirises Saudi Arabia’s ban on women driving. Albutairi’s wife, Loujain Al Hathloul, got into trouble with the authorities in 2014 for taking part in a demonstration against the ban. Albutairi recently branched out into acting, playing a lead role in the 2015 Arab road movie ‘From A to B’, directed by Emirati Ali Mostafa. He has more than 1.7 million Twitter followers. 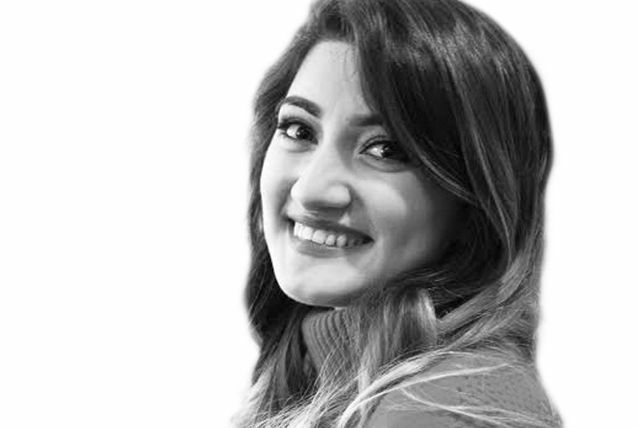 A health campaigner, Maryam Matar has dedicated her career to fighting genetic diseases and sits on the boards of numerous organisations that work to protect public health. She is founder of the UAE’s Down’s Syndrome Association and the Genetic Disease Association, the latter of which she chairs. A certified family physician, Matar graduated from the Dubai Medical College in 1999 and later specialised in Community Medicine, which is based on in-depth involvement of the practitioner with the patient’s social, financial and psychological issues as well as health-related diagnosis and treatment. She initiated many national community outreach programmes such as the ‘UAE Free of Thalassemia by 2012’ campaign, and the Wellness Centre institution. She is deputy chairperson of Dubai Cares, a board member of the Marriage Fund, Awqaf and Minors Affairs Foundation, Dubai Women Establishment and the Canadian University of Dubai. She has also served as director-general of the Community Development Authority, and was the first woman to become under-secretary for the Ministry of Health. Matar has been honoured with numerous awards for her work over the years, including Best Healthcare Project across all Higher Colleges of Technology campuses in the UAE in 2002, Best Community Project of the Sheikh Mohammed Bin Rashid Programme for Leadership Development (2004) and the Emirates Business Women Award for Professional Excellence (2004), among others. She has claimed she wears 11 different hats in one week because of her involvement in such a wide variety of organisations. Rising media star and public speaker Ali Al Saloom aims to increase cultural awareness of the UAE across the Gulf and beyond. Educated in the US and Canada, Alsaloom has lived in several countries, including the UK, France, Hungary and Spain, and says this has given him a deeper appreciation of his Emirati heritage. With a university degree in hospitality management and tourism and a Master’s in Brand and Cross-Cultural Management, Al Saloom wanted to apply his knowledge to his hometown’s fast-growing tourism industry. He joined the Abu Dhabi Tourism & Culture Authority in 2005, helping to build the city’s first Meeting, Incentives, Conference and Exhibition (MICE) department. His strong communication skills and sense of “showmanship” meant he became the go-to employee to deliver special city tours and presentations to VIP guests, including actor Antonio Banderas and architect Frank Gehry. Since leaving the authority to build his own business, he is now a recognised cultural and tourism ambassador for the UAE. He has delivered hundreds of cultural awareness talks and seminars to businesses looking to set up or expand in the emirates via his holding company Maestro Enterprises, as well as advising tourists and other members of the public via his TV show ‘Ask Ali’, which answers questions on all things Emirati, from the country’ working hours to must-see destinations. He was chosen as the Best Male Personality in 2010 by Ahlan magazine for his work and was named as one of Time Out Dubai’s 40 Local Heroes in 2008. Al Saloom is also a member of the Professional Speakers Association of the Middle East. 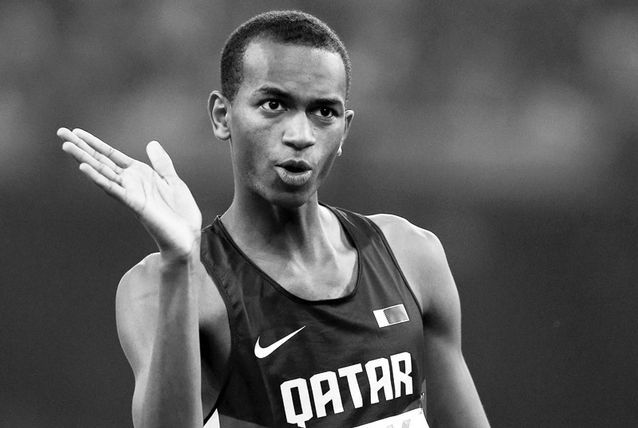 Mutaz Barshim was a champion by the age of 19. Five years later, he is showing no signs of slowing down. He is particularly dominant in high jump, in which he holds the national and Asian records for his jump of 2.43 metres, set at the Adidas Grand Prix in New York in 2014. It was only 2cm off the world record. Barshim set his first Qatar national indoor record in 2010 in Gothenburg with a jump of 2.25 metres, after which he went on to win the gold medal at the 2010 Asian Indoor and World Junior Championships and the 2011 Asian Athletics Championships and 2011 Military World Games. Following that, he won the bronze medal at the 2012 Olympic Games in London. He has sights set on his first Olympic gold medal at the Brazil event this year. Barshim has credited his sporting success to his father, who was also a track and field athlete who competed in middle and long distance running. He told International Association of Athletics Federations (IAAF) that he “grew up nothing special, like any kid in Qatar”. But in the eyes of Qatar and the world, Barshim is today without a doubt someone special. As head of Middle East relations for the world’s largest private foundation, the Bill and Melinda Gates Foundation, Hassan Al Damluji is helping to manage colossal change in the Arab world. Last year, he led a $2.5bn development fund in partnership with the Islamic Development Bank that aims to tackle poverty in the Islamic world. The Lives & Livelihoods Fund will finance projects in areas of health, agriculture, and basic infrastructure. Al Damluji also focuses on health issues including polio and malaria, which he says are major health concerns in the Arab world. The Bill and Melinda Gates Foundation itself aims at improving healthcare and education as well as decreasing poverty worldwide. Though it focuses on Sub Saharan Africa, South Asia and parts of China, it has attended to the Middle East’s poorer areas as well as sought cooperation from Gulf countries, who have given heavily to the foundation. Prior to taking on his position at the foundation, Al Damluji worked as an engagement manager at consultancy McKinsey. He has an Master of Arts in Middle Eastern Studies from Harvard University and a double first in Classics and Arabic from Oxford. Blogging has changed the lives of many, not least Hayla Ghazal. Now the owner of a fashion boutique and a successful blogger, she began by launching her own YouTube channel and blog, HaylaTV, at 18. Intended to help shy teenagers like herself deal with peer pressure, the channel comprised everything from makeup tutorials to cooking tips and style advice. “It’s great to see more women recognising how technology can empower them to own their own voice, speak up and share anything they want,” she told Arabian Business recently. At 20, Ghazal now has her own brand extension, including a fashion boutique called Hayla Couture, featuring evening gowns and bridal dresses, and a strong following of over 400,000 on her blog and social media pages. But they were not Ghazal’s first career ventures. At 15, she took a part-time job at a fashion agency, which helped to push her into her current direction. Ghazal is also pursuing a business management degree. Yassin Alsalman is often most recognised for his role as “Khalfan” in the 2009 multilingual Emirati film, ‘City of Life’, directed by Ali F. Mostafa. But as well as an actor, he is a hip hop MC and journalist. While he hails from Iraq, Alsalman was born in Dubai and grew up between the UAE and Canada. In 2000, he settled in Montreal to work on what he calls his true passion – music - where he is best known by his stage name, The Narcicyst. In Canada he produced four albums in a local recording studio - Fear of an Arab Planet, The Narcicyst, Mr. Asthmatic, and his latest work, World War Free Now! (2015). In January 2011, a single titled #Jan25, featuring Alsalman and several other artists, was credited as having played an influential role in the Egyptian revolution, which started on the 25th of January, 2011. The song was an ode to Twitter and its role in giving a voice to the people of Egypt during the revolution. Alsalman’s other successful singles include Fly Over Egypt (2012) and Leap of Faith (2012). The young journalist, also known as Narcy, once co-taught a course on hip hop history at Concordia University. Ramzi Jaber is changing the world one infographic at a time. Alongside Joumana Al Jabri, he co-founded Visualizing Impact (VI), a non-profit organisation that uses design and technology to create infographics, or data-based stories, aimed at informing the public about social justice issues and encouraging social change. It was under this firm that he started Visualizing Palestine, a similar initiative focused on social injustices in Palestine, from unfit drinking water in Gaza to the imprisonment of Palestinian civilians without trial. The idea for VI first came to Jaber after he quit his job as a civil engineer to organise an independent TEDx event in Ramallah. The event had such a profound impact on him, for 18 months afterwards, he kept “asking myself two questions over and over again. Why are we in this mess? And who is doing something about it?” he told Kalimat magazine. Today, Jabri’s infographics have been used in publications including The Guardian, and on Huffington Post, Al Jazeera, and Daily Beast. They also have been used in books and universities to help design students. 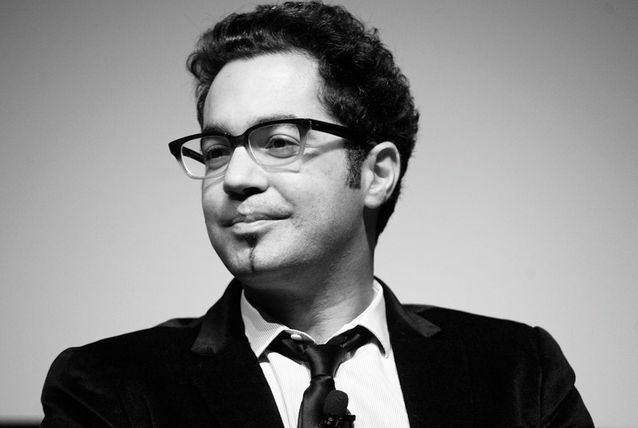 Jaber is also the co-founder of onlinecensorship.org, a platform for people to crowdsource examples of censorship enacted by social media companies. In 2013, Jaber was awarded a fellowship by Ashoka, the world’s largest network for social entrepreneurs. Fahd Hariri is the youngest son of former Lebanese Prime Minister Rafik Hariri, and also one of the world’s youngest billionaires. While studying for an architecture degree at the Ecole Speciale d’Architecture de Paris, he opened up an interior design shop outside the French capital that sells furnishings to Saudi Arabia. But Hariri’s expertise lies in property and construction. He has previously served as chairman of Saudi Oger’s subsidiary in Dubai. 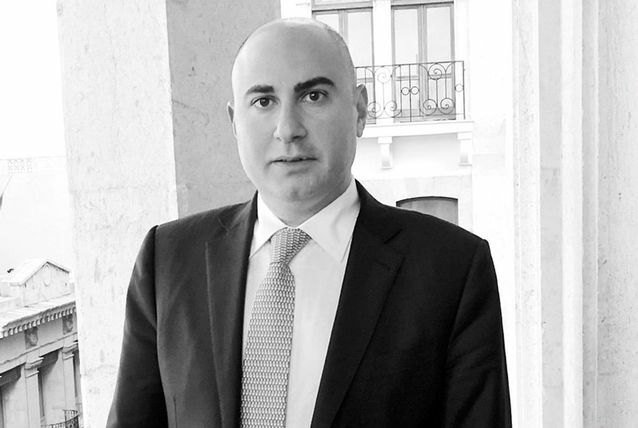 Hariri is currently president of Har Investment Fund, and a member of the advisory council at Lutetia Capital SAS. There are few people empowering women refugees. One of them is Zeina Abou Chaaban. 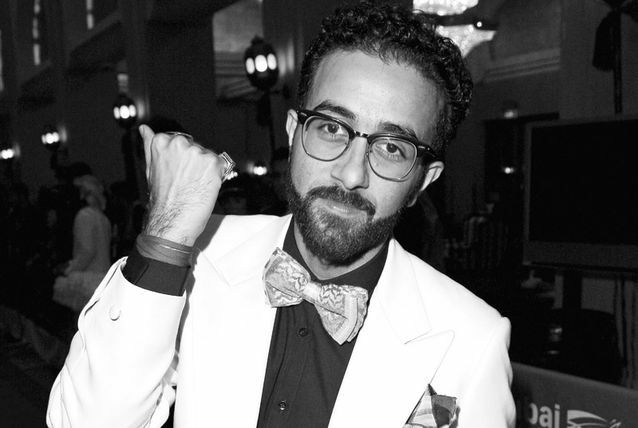 Originally a logistics planner for Procter & Gamble (P&G) in Dubai, Abou Chaaban is the co-founder of heritage-based fashion brand, Palestyle. The business model involves paying women in refugee camps for embroidery work, which is then stitched into a Palestyle design. Part of the proceeds of sales also are diverted to social development projects in the camps. So far, the brand has employed 100 refugee women to produce the embroidery and benefited over 4,000 refugees with social projects such as a water tank exchange program and olive tree plantation. Abou Chaaban told The National newspaper that what makes embroidery unique is that it speaks the language of a culture. The refugee women use the traditional Palestinian embroidery style for all their work, which is then used for Palestyle products such as pillow covers, bags and menswear. Palestyle has become so popular it is now being sold in some of the world’s top high-end retailers including Bloomingdales, Etoile, and House of Frasier. Its products have been seen on celebrities such as Gwyneth Paltrow and Eva Longoria and are available in boutiques across the UAE, Qatar, Pakistan, and the UK. The idea to merge heritage and fashion came to Abou Chaaban while on a visit to a refugee camp in Lebanon. She was inspired by the colourful embroideries of refugee women who, despite living in harsh conditions, continued to engage in the age-old Arab tradition. Today, she runs the firm alongside her brother Ahmed, who joined her in 2011. Reem Khouri learned a thing or two from her former mentor and boss, Aramex founder Fadi Ghandour. Having worked for him as manager of CEO operations for six years from 2007, Khouri developed a passion for supporting entrepreneurs and social inclusion. 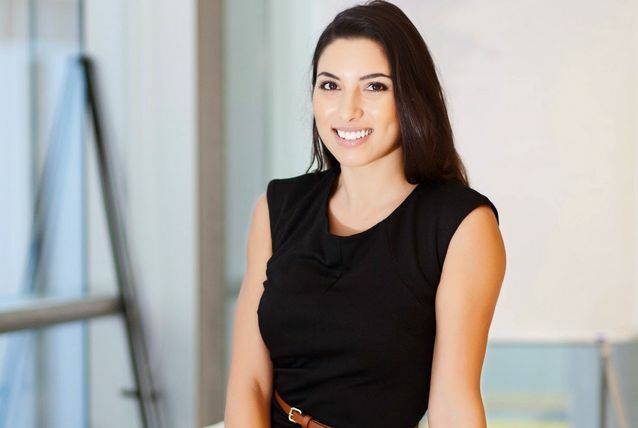 Five months after leaving Aramex, she launched her own firm, Kaamen, in April 2014. Kaamen, which means untapped potential in Arabic, is an enterprise that creates and implements profitable social investments and programmes that allow organisations to benefit from the returns and potentially become leaders of social progress. It works by partnering with other enterprises, governments, non-profit organisations and communities. The firm is based on Khouri’s belief that in the long-term profit can only be sustainable if societies become part of the business model. The 34-year-old also serves on the board of directors of non-profit organisation Ruwwad, which helps underprivileged or troubled communities in Jordan, Palestine, Lebanon, and Egypt overcome marginalisation through youth activism, civic engagement and education. Khouri is on several other boards including the Ruwwad Micro Venture Fund, Ethaar Journeys and Nakhweh. She currently works between Jordan, Palestine and Saudi Arabia and has plans to expand into Asia and the US. 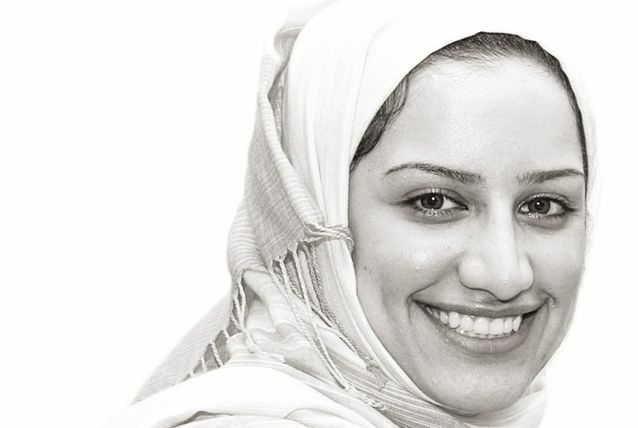 Amal Al Marri co-founded pop-up food concept SALT with Deem Al Bassam in mid-2014. Now, in mid-2016, SALT is still one of the most popular dining destinations in the UAE, regularly visited by the royal family, particularly Crown Prince of Dubai Sheikh Hamdan bin Mohammed Al Maktoum. Part of its appeal has been SALT’s widespread social media campaign, #findsalt, which sends followers clues about the pop up’s next location only hours before its appearance. Following the campaign and word-of-mouth, the brand’s Instagram followers topped 62,000 and SALT became one of the most talked about concept kiosks in the country. The pop-up serves a simple street food menu comprising of ever-changing burgers, fries, shakes and desserts. 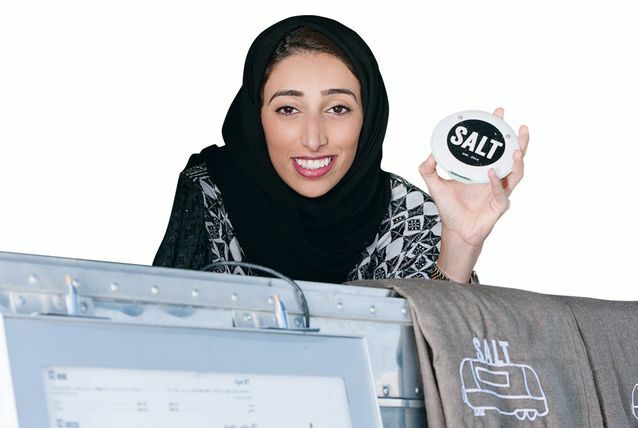 While a growing number of similar concepts are filling the pavements of the UAE, SALT has differentiated itself by deliberately setting up in underserved areas, such as public beaches and creating an atmosphere that encourages “locals to feel like tourists and tourists to feel like locals,” Al Marri told Buro 24/7 magazine. SALT is not Al Marri’s first business venture nor her last. The Emirati national and her Saudi partner launched Switch restaurant in Dubai Mall in 2009 and are currently working on their third concept. Both Al Marri and Al Bassam have a background in art design. 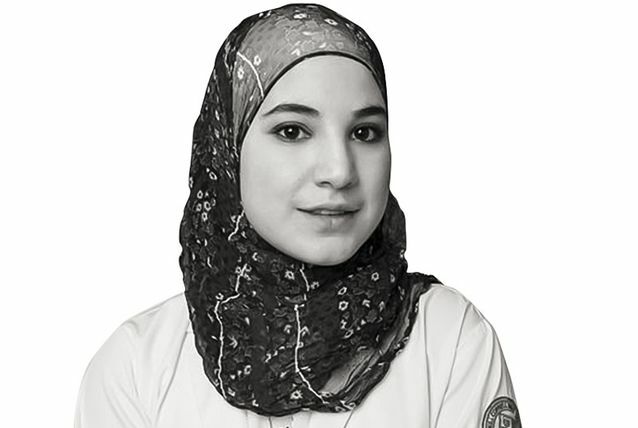 Few can say they graduated from high school aged 12 only to become the world’s youngest Arab doctor at 20. No one but Iqbal Al Asaad, that is. Earning the title in 2013, Al Asaad completed high school in Lebanon with exceptional skills in mathematics and biochemistry. She then caught the attention of Lebanon’s education minister who helped secured her a medical scholarship in Cornell University’s Qatar branch, Weill Cornell Medical College. Al Asaad completed her residency in paediatrics at the Children’s Hospital in Cleveland, Ohio. However, working in the US was not in Al Asaad’s plans. Growing up in Lebanon, she had visited her relatives in refugee camps and dreamt of building them hospitals and providing them with free medical care. But her dream is yet to be fulfilled. She is banned from working in Lebanon’s public hospitals because of her Palestinian heritage, despite support from government ministers. But Al Asaad is doing well nonetheless, having been recognised for her accomplishment and honoured by former Lebanese president Michel Suleiman and the Palestinian National Authority with a Qods award. Al Asaad credits her success to her toddler self, who spent days listening to her father tutor her older brothers. It does not get much more exciting than Omar Samra’s life. He is best known for being the first Egyptian to climb Mount Everest and the Seven Summits and ski to both the Geographic South and North Poles. The adventurer reached the highest point on Earth in 2007 and completed the Seven Summits challenge in 2014, becoming the first Egyptian to complete the “Explorer’s Grand Slam”. But Samra’s impressive list of accomplishments does not stop with physical endurance. The 37-year-old graduated with a Bachelor of Arts with a major in economics and a minor in business administration and earned an MBA, particularly concentrating in entrepreneurship, from the London Business School in 2007. Two years later he founded Wild Guanabana, a carbon-neutral travel company specialising in ethical and adventure travel. Guanabana has offices in Cairo and Dubai, where Samra lives. 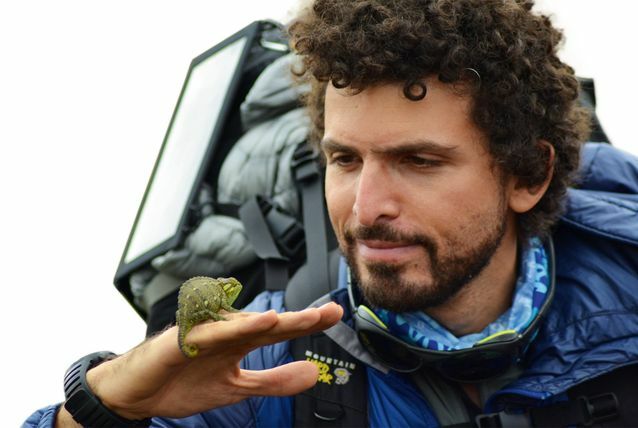 Samra had worked at HSBC in London and Hong Kong for two-and-a-half years before he threw it in to embark on a 370-day journey across 14 countries in Asia and Latin America that sparked his fascination with travel and adventure. Where to next Samra? 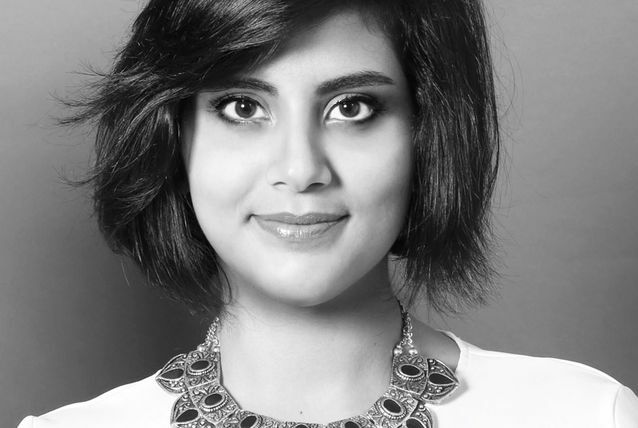 Loujain Al Hathloul made global headlines when she was arrested for driving in Saudi Arabia, defying the kingdom’s informal ban. The women’s rights activist and social media figure was again detained on December 1 last year, when she attempted to drive from the UAE to Saudi Arabia to highlight the discrepancy in the kingdom’s ban compared to other Gulf states that allow women to drive. 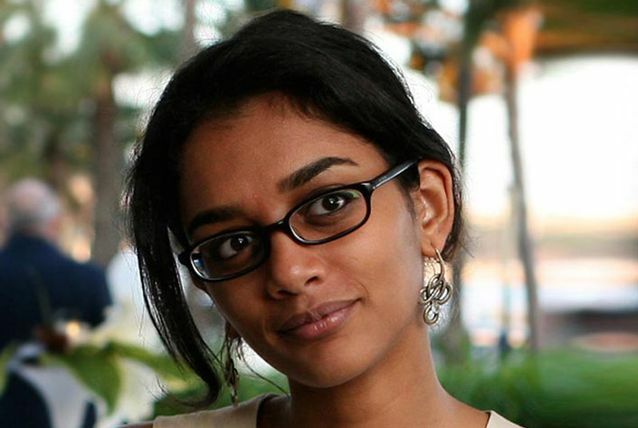 Arrested on the Saudi side of the border, she was held for 73 days. In an interview with The Telegraph, Al Hathloul revealed that her father, who supports the campaign, was in the passenger seat at the time. She credits her freedom to her liberal father. Al Hathloul was also among the first women to run for local council in Saudi Arabia’s historic elections in December, last year. But she said she was not interested in competing or winning. “I’m focused on increasing the number of women who stand in elections,” she told the British daily. The activist is married to Fahad Albutairi, a renowned YouTube personality and Saudi’s first stand-up comedian to perform professionally. “You were born unique and you should continue your life journey being unique.” Lama Younis is without a doubt unique. The Saudi national is a forensic psychologist, criminologist, and founder of Hissah Enrichment Centre. As a Saudi woman, it was not easy for Younis to acquire the three titles, which is why she is also an advocate for personal and social improvement and hopes to push women in the GCC to “follow what they really want to be”. Her enrichment centre, named after her mother and launched in 2013, focuses on the prevention of child abuse and the empowerment of its victims in the region. It also works to enrich interpersonal skills, develop personal empowerment, and improve social relationships on personal and professional levels for adults, youth and children. Younis completed her counselling psychology studies at Effat University in Saudi Arabia in 2005. She then went on to obtain a Master’s Degree in Criminology and Forensic Psychology from Middlesex University in London, after which she finished her PhD in Childhood Studies in the UK. 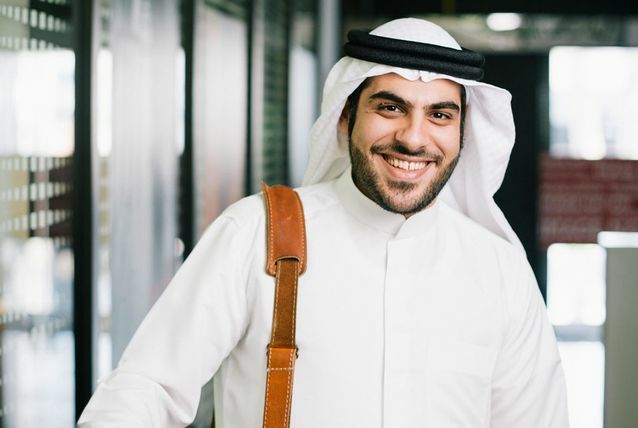 Khalifa Saleh Al Haroon graduated with a law degree and worked in investment banking, but he ended up as an online specialist — and a successful one too. He is best known for founding several companies including a popular digital network of websites including the brands iLoveQatar.net, Qatar Events, and Qatar News, as well as online programmes such as QTips, Mr. Q Visits, Karak Time, Raqami TV, and Top 5 Everything. 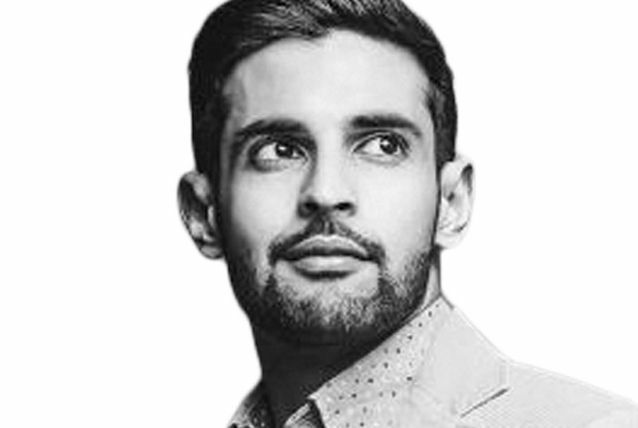 He is also the founder and CEO of Haroon United Group (HUG), a holding company housing a range of brands and start-ups including Shake Shake and King Koil, as well as the executive director for marketing and communications at Qatar Stars League, Qatar’s top football league. 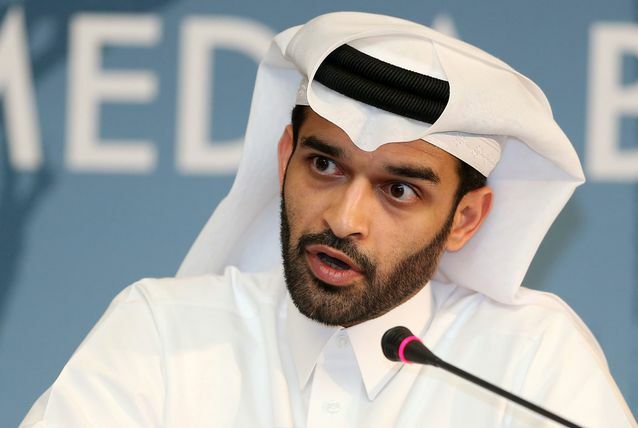 For his achievements, he was named Entrepreneur of the Year by Qatar’s Ministry of Information and Communications Technology in 2011, made an ambassador for Qatar’s National Cancer Programme, a board member of the Internet Society (ISOC) and vice president of the Entrepreneurs’ Organisation (Qatar). Al Haroon is currently working on Identity Qatar, a joint venture with PJ Media, run by Peter Jones from Dragons Den, ILQ Radio, Shake Shake and Misha. Jeehan Balfaqaih doesn’t work in the spotlight, but she certainly ensures her clients get plenty of attention. They include some of the largest local government and semi-government entities in the Gulf, as well as blue-chip firms from around the world. 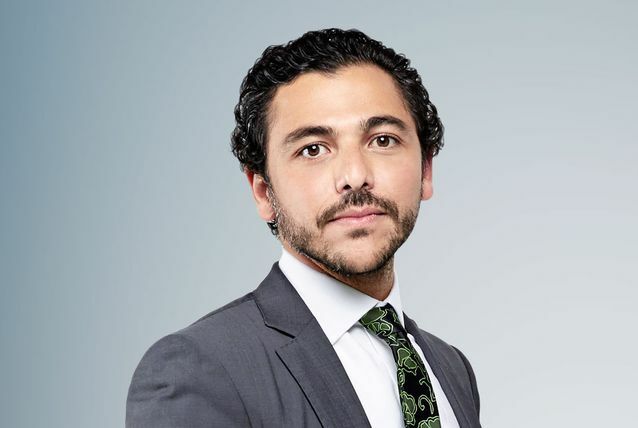 Balfaqaih earned a Bachelor’s Degree from McGill University in Montreal, Canada, and has gone on to become a partner of giant advisory firm Brunswick Group, as leader of the international firm’s Arabic capabilities. As the first recruit in the UAE for Brunswick, which specialises in critical issues and corporate relations, Balfaqaih was instrumental in building the firm’s presence and offer in the GCC over the last nine years. 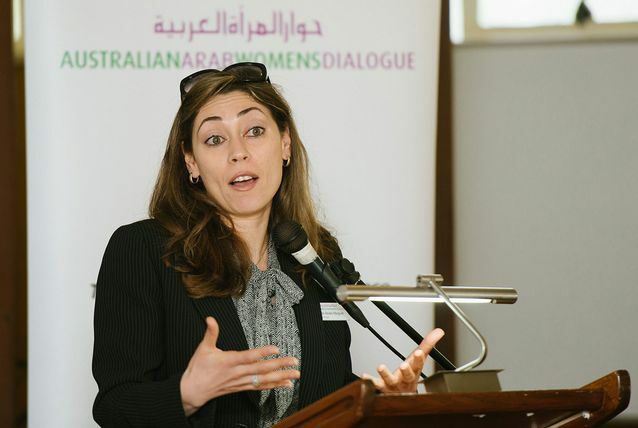 Her contributions were recognised by the firm in 2013, when she was accepted into the partnership to become the first Arab partner in Brunswick. Balfaqaih was raised by her parents who believed in gender equality and encouraged their six girls to follow their dreams however big they are. Through mentorship, she supports young women to understand their potential and follow their own dreams. On the other side of the spectrum, Balfaqaih supports diversity on boards and has helped in 2015, as a steering committee member, launch the GCC Chapter of 30% Club — a volunteer effort of multi-sector leaders working together towards better representation of women on boards and in senior level positions. The 37-year-old is also a published poet. Founder of Veritas Films production company, Mahmoud Kaabour is a multi-award-winning filmmaker, writer and public speaker. Kaabour graduated from the Mel Hoppenheim School of Cinema in Montreal and went on to join the National Film Board of Canada and the Canadian Broadcasting Corporation. Heavily interested in documentaries, Kaabour founded Veritas Films in the UAE in 2008. It exclusively produces non-fiction content. Through Veritas, he has created documentaries and films for the Ministry of Presidential Affairs and the Executive Affairs Authority in Abu Dhabi, the Abu Dhabi Urban Planning Council, Abu Dhabi Authority for Culture and Heritage, Dubai Holding, and Dubai Investments subsidiaries. But Kaabour is most recognised for his first feature film, ‘Being Osama’. The documentary shows the lives of six men sharing Osama Bin Laden’s first name in the period after the September 11 terror attacks. The film received four international awards and was aired on 12 international channels, making Kaabour the youngest commissioned filmmaker in the history of Canadian television. Kaabour’s other works, including the films ‘Teta, Alf Marra’, also won five major Audience Awards and Best Film awards as well as recognition from publications including The New York Times, and a special jury mention at its world premiere at the Doha Tribeca Film Festival. Impressively, it was the first documentary produced in the GCC to qualify for an Academy Awards nomination. Kaabour’s third film, ‘Champ of the Camp’, was probably the most controversial of his works. It is set in UAE labour camps and follows a Bollywood singing competition that moves across 70 camps to select a winner. The movie was narrated and sung entirely by real-life labourers. It premiered at the Tenth Dubai International Film Festival in 2013 with a special screening at the Burj Khalifa. You would never guess that Awni Farhat was born in a refugee camp in the Gaza Strip. He is multilingual and has worked as a translator for international journalists and activists, has project managed the Children Monitoring and Reporting Groups Coalition — which supports Palestinian children and is funded by Save the Children International — and is the products and endorsements coordinator for the international campaign Gaza’s Ark. It is safe to say that he has achieved more than many would have hoped to achieve in their lives. But his resume does not stop there. In 2014, Farhat set up a crowdfunding website that allows visitors to donate money towards any of the not-so-typical causes listed on the site. His own cause? Farhat was inspired to create the site because he needed help funding a Master’s Degree programme in Violence, Conflict, and Development in the UK, a qualification he wanted so he could return to Palestine and help make a difference. A year later, Farhat hit his target. He responded aptly on his website: “I have come to believe strongly that knowledge and education are the most powerful tools that we can use to change the world”. 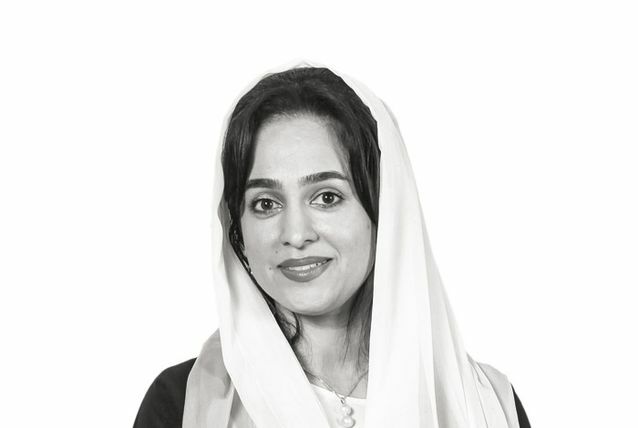 May Habib’s impressive record started at Harvard University, where she gained a degree in Economics and Near Eastern Languages and Civilisations in 2007. With that in hand, she began working at Lehman Brothers, where she helped US software companies raise capital. From 2009 to 2011, Habib was vice-president of the Abu Dhabi sovereign wealth fund Mubadala, where she helped to build a portfolio she says is now worth more than $20bn. Today, she is the co-founder and CEO of Qordoba, a technology, cloud-based company that globalises digital content and employs 31 staff. “If you had told someone you were building a tech team in the Middle East a few years ago, they would have thought you were insane! Today we’re showing we can write software here that disrupts industries,” Habib told the Cartier Women’s Initiative Awards in 2014. Habib was born in Lebanon, grew up in Canada and spent several years in the US before moving to the Middle East in 2009. 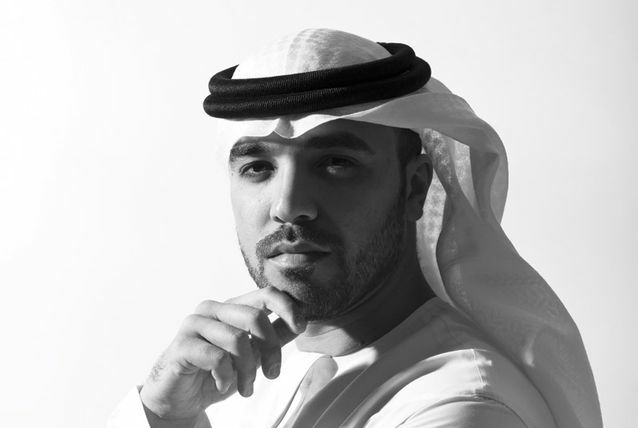 You will not be disappointed reading one of Khalid Al Ameri’s blogs or listening to one of his motivational speeches. 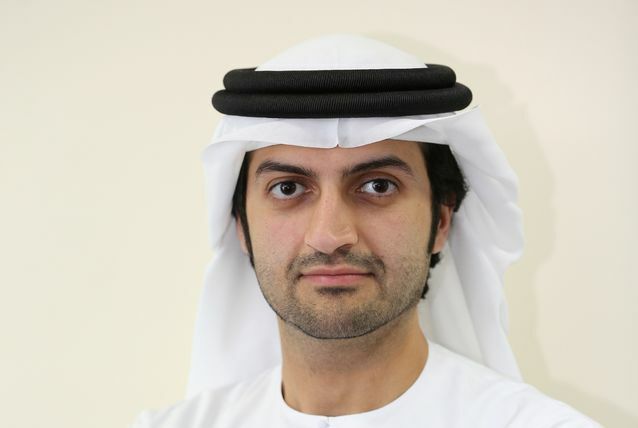 He has done everything from sailing on oil tankers to working on investment projects at Abu Dhabi sovereign wealth fund Mubadala and co-founding food and beverage company Slices. The opinion writer, motivational speaker, and youth coach shares his views on concerns in the region including social development and employment. He also discusses managing relationships, living a better life, and doing the work you love. Al Ameri’s latest venture is the start-up Global Possibilities, which he set up in Abu Dhabi alongside Emirati entrepreneur Omar Al Busaidy. Global Possibilities is aimed at equipping youth, students and entrepreneurs with the skills, knowledge and understanding required to create a unique UAE work culture. Al Ameri graduated with an MBA in Business from Stanford University and is currently working on his first book. Soha Al Qeshawi’s dream of working with spacecraft came true when she joined NASA’s Space Shuttle programme immediately after graduating from the University of Houston, where she studied engineering. The Palestinian, who grew up in Gaza City, is currently working on NASA’s Orion spacecraft programme, helping to design and engineer the vessel, which is intended to one day transport astronauts into deep space. As a senior software engineer, Al Qeshawi’s roles range from testing the systems at launch, through flight, and back to Earth, to finding and resolving issues and retesting to ensure safety. Al Qeshawi has been hailed for her positive role for Arab women across the world. Her advice to young girls, would be to, “always dream big, and work really hard to make your dream come true. Mine did,” she said. 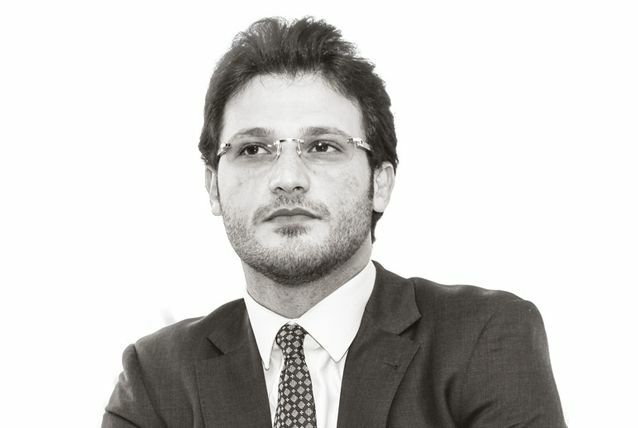 Philippe Ghanem established ADS Securities, the brokerage arm of the then newly formed ADS Holding, in Abu Dhabi in 2011, with a starting capital of $400m. It began as a dealer in foreign exchange and bullion and within months was trading more than $2bn a day worth of financial instruments and commodities and has since multiplied several times, becoming one of the world’s fastest growing forex traders. The Abu Dhabi firm is the largest brokerage by volume in the Middle East and one of the fastest growing forex and investment companies globally. In 2014, ADS Securities expanded into new services, including investment banking and asset management, following its acquisition of a London brokerage firm that it has developed into a full-service financial firm. The company also has regional office in Hong Kong and a support office in Singapore. Described as being one of the key driving forces behind the conception and creation of ADS Securities, Ghanem has a wealth of experience in both establishing and running successful entrepreneurial ventures in the financial services sector. 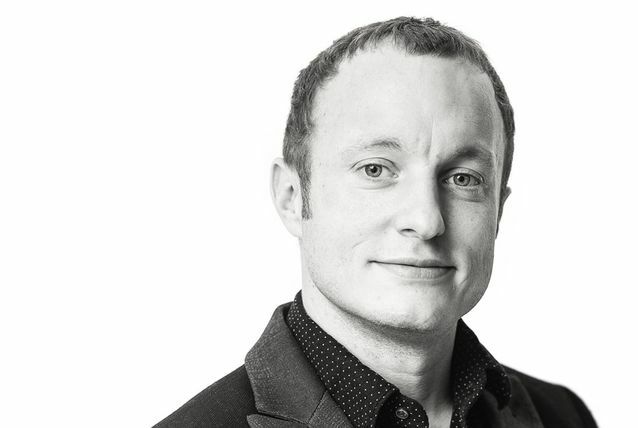 Prior to ADS, he co-founded Dublin-based financial brokerage firm Squared Financial Services, which he helped develop as a multi-asset class e-trading platform. He brought that expertise to his current role as vice-chairman and CEO of ADS Securities, with deep expertise in building sophisticated electronic trading platforms as well as strong contacts across international markets. Ghanem is a regular contributor to international and business media including CNBC, Forbes, Reuters and specialist trade publications. The British Emirati film-maker, director and producer is perhaps best known for directing the first Emirati feature film ‘City of Life’ in 2009. But he has gone on to do far more and just this month announced he is reteaming with Image Nation Abu Dhabi for his next feature, ‘The Worthy’, set to go into production later this year. He will be joined by Hollywood veterans Peter Safran (‘The Conjuring’, ‘Annabelle’) and Steven Schneider (‘Paranormal Activity’, ‘Insidious’) who will produce the dystopia film with Mostafa’s regional producer Rami Yasin. Mostafa once said he created ‘City of Life’ to show the positives and negative sides of Dubai, and to change the global perception of the city as an artificial and glamorous place. His idea delivered, as the movie ranked second in the local box office and made over AED500,000 ($136,000) in its first weekend, according to Italia Film International. 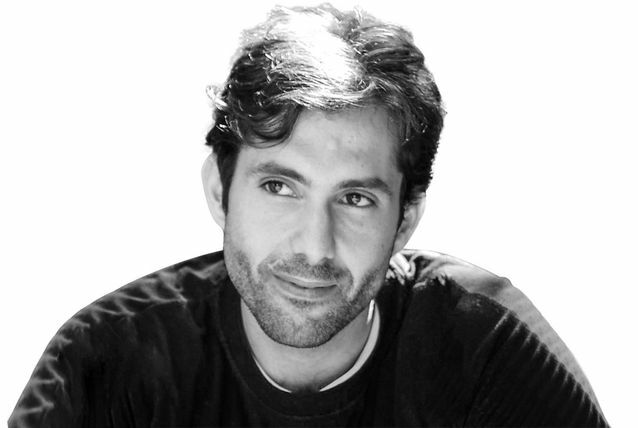 Mostafa also directed several short movies including ‘Under the Sun’, which won the Emirates Film Competition in 2006 and was screened in the Dubai International Film Festival, Rome, Rhode Island and San Francisco International Film Festivals. He owns a production company, AFM Films, and has worked on many commercials for brands such as Range Rover, Sony, and Etisalat. The 33-year-old has a Master’s in practical training in film technique from the London Film School. He is the Middle Eastern brand ambassador for Dunhill and is also the goodwill ambassador for Visit Britain. As well as lecturing on law at King Saud University in Riyadh and acting as legal counsel to the Ministry of Petroleum and Mineral Resources, Abdullah Al Jumah is an acclaimed author. The Harvard Law School graduate was inspired to become a travel writer after the impressive response he received from his Twitter followers each time he tweeted about his travels. Jumah wrote the book Tales of a Saudi in Europe after being inspired by those who followed his journey with him online. In the book, a collection of 11 stories and anecdotes from nine different European countries, Jumah writes from the perspective of a Saudi trying to relate to entirely different cultures. “It was all about travelling as a traveller and not as a tourist. It’s a different experience that people should try once in a while, because it gives them a chance to deeply explore the country they are visiting and engage with other cultures in a more meaningful way,” Al Jumah said in an interview with Gulf News last year. He makes an effort to interact and mingle with locals wherever he travels to, which he says creates a more complete travel experience. Jumah’s other books are ‘Greats Without Schools’ and ‘Orphans who Changed the Course of History’. Being paid by a billionaire to skip college and get straight into a day job does not happen very often, but when PayPal co-founder Peter Thiel offered Jihad Kawas $100,000 to work on his start-up Saily, the young Lebanese high school student jumped at the chance. He was one of 20 to secure funding from over 3,000 applicants. Kawas’ app Saily aims to change the way we buy and sell online. Described as Instagram for classified listings, Saily is a photo-focused app that connects sellers to buyers nearby. It allows neighbours and communities to communicate and negotiate prices on everything from an Apple computer to used Nikes. In its first seven months, Saily recorded 150,000 users – the current registration rate is 1,000 users per day – and rung up more than $5m in sales. Before graduating from high school in Beirut in the spring of 2015, Kawas had already taught himself to code and forged a path as a digital entrepreneur. A son of small business owners, Kawas started his first company at the age of 13. He has won global entrepreneurship competitions, and given two TEDx talks. He currently resides in San Francisco. Handed the reins of his father’s manufacturing and construction business at the age of 32 felt like a very natural progression for Mohammed Khammas. Previously, he had worked in many facets of Al Ahli Holding Group, including the construction and real estate arms, where he oversaw some major projects. In the seven years since he became CEO, Khammas has guided and diversified the company into a multi-billion-dollar conglomerate of more than 30 companies present in over 25 countries, employing more than 9,000 people worldwide. In addition to managing a diverse portfolio, Khammas was the first Arab to develop and sell a multi-million-dollar game development company to the Walt Disney Company. During this process, he has established long-term strategic alliances with the global entertainment industry’s major companies. Today, AAHG’s portfolio in the entertainment industry includes Dubai Outlet Mall, Gold’s Gym International franchise rights, plus exclusive rights to publish comics and activity books belonging to Marvel, Disney, Warner Bros, DC Comics, San Rio and Comicave. In November last year, the company announced plans to launch a 20th Century Fox World theme park and resort in Dubai. The agreement signed with the US entertainment giant allows AAHG to build four Fox theme parks outside of the US, the first of which will be located beside the AAHG’s Outlet Mall and Dubai Holding’s proposed Universal Studios Dubailand project. Separately, AAHG also announced plans to develop a 25,000-seat open-air amphitheatre, also adjacent to the Outlet Mall. The venue, featuring pavilion hosted boxes, suites and terraces will be the only one of its kind in the Middle East. Khammas also formed the Young Arab Leaders organisation (YAL), which has become a platform for a new generation of Arab thinkers from more than 30 regional countries. At the age of 25, Raha Moharrak became the youngest Arab and the first Saudi woman to conquer Mount Everest. Prior to tackling the world’s tallest mountain in 2013, Moharrak had already climbed Mount Kilimanjaro, Mount Vinson (Antarctica), Mount Elbrus (Russia) and Aconcagua (Argentina), along with a host of other peaks on different continents. She said in an interview that in searching for something different and adventurous, she explored the idea of climbing Mount Kilimanjaro, having already mastered scuba diving, sky diving and shark diving. “I got a lot of resistance from my society and the people around me, which further pushed me towards taking the decision to actually climb it. I felt like this was something that I really wanted to do and it would give me a completely new and different outlook on life in general,” she said in an interview with Edarabia education journal. She spent months in Nepal before executing her plan to conquer Mount Everest. She was joined by 34 other mountaineers and 29 guides in reaching the summit on May 18, 2013 from the Nepalese side of the mountain. Moharrak also has revealed details of a planned book entitled ‘For All Us Dreamers’, the story of the Saudi woman who endeavoured to touch the sky. She is also studying an MBA in Women’s Leadership at Synergy University Dubai Campus. As a Syrian, Kais Salman’s homeland provides him with plenty of inspiration for his paintings. The contemporary art pieces use satire to subvert the normalisation of greed, vanity, and ideological extremism. Salman says each of his series of works has sought to reflect a type of psychological violence that occurs when excess becomes rationalised and accepted by societies. Terrorism, consumerism, cosmetic surgery, and the voyeurism of the digital age have all served as topics of Salman’s carnival-esque compositions. Born in Tartous, Syria in 1976, Salman now lives and works in Beirut. He received a Bachelor of Arts from the Faculty of Fine Arts, Damascus in 2002. His paintings are currently housed in private collections throughout the Middle East, North Africa and Europe. Solo and group exhibitions include the Alexandria Biennale (2014); Ayyam Gallery DIFC, Dubai (2014, 2010); Ayyam Gallery Beirut (2015, 2014, 2012); Ayyam Gallery Al Quoz, Dubai (2014, 2011, 2010); Damascus Museum of Modern Art (2009); The Park Avenue Armory, New York (2008); Carthage Festival for Coast Mediterranean Sea Artists, Tunisia (2005). In May 2010, a work from his Fashion Series appeared on the cover of the Wall Street Journal’s Weekend Edition magazine, a first for an Arab artist. An award-winning entrepreneur, Miami-based Nadine Hanafi specialises in teaching people how to tell a story better. Known to some of her clients at the ‘PowerPoint Whisperer’ (in reference to the film ‘Horse Whisperer’), Nadine has made a name for herself by helping people to transform their presentations through her company We Are Visual. She was featured as one of the US’s leading entrepreneurs under 35 by Empact, an organisation that celebrates the impact and diversity of young entrepreneurs. Originally from Morocco, Hanafi started the presentation design from her living room in 2013 and within 14 months she grew the business to six-figure revenue with no external capital. In December 2014, it was voted Miami’s Most Innovative Start-up and received the award for Best Design. As the creator of the Gazan version of Uber, 26-year old Mariam Abultewi has shown the type of creativeness that is required when telecommunications are greatly restricted. Her version of Uber works offline. Abultewi came up with the idea for Wasselni when, as a 22-year-old, she was waiting for a lift in the middle of the Gaza Strip. Funding for the idea was not initially forthcoming when she pitched it to investors in 2011. With the help of Gaza Sky Geeks, the first start-up accelerator in the Gaza Strip, she scored funding from Palinno, a Palestinian operation that works in both Gaza and the West Bank. It was one of the first start-up investments in Gaza, and she sees it as a step toward changing attitudes that still linger in the Middle East. Taxi drivers and taxi companies who join the Wasselni system are sent real-time notifications from users using the mobile and web app connected to Wi-Fi. The taxi company deals with incoming requests from customers and then forwards them to drivers who do not have smartphones. The taxi drivers/companies pay a portion of their Wasselni-linked earnings back to the company. Wasselni also works as a social network, allowing users to follow each other, find their friends’ trips, add comments on each other’s posts, and even ask to join their friends’ trips. 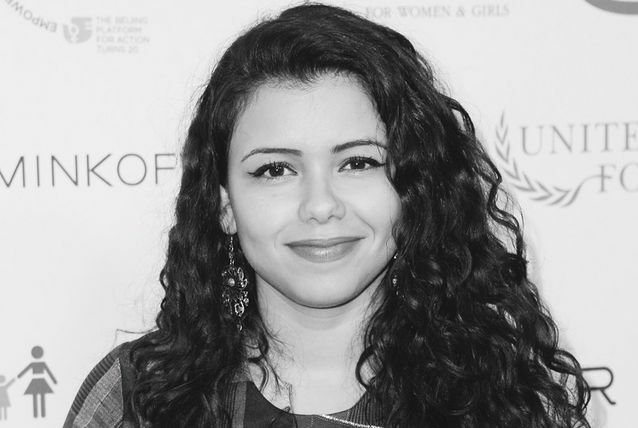 Aya Chebbi, an award winning Pan-Africa feminist, activist and blogger, started her activism at summer camps, as a peer educator on sexual health and HIV/AIDS and as a Red Crescent volunteer. As a children’s mentor, Aya helped direct a national organisation for Tunisian children, improving to improve their lives and protect their rights. She organised workshops and events for orphans, handicapped and hospitalised kids, mainly suffering from cancer. After the 2011 revolution in Tunisia, she volunteered at the refugee camps on the Tunisian-Libyan borders to help Libyan children during the refugee crisis. She considers that her life’s mission is to put smiles on children’s faces. She has spoken widely about social movements worldwide for conferences and rallies in the US, Canada, Poland, Turkey, Kenya, Ethiopia and South Africa, among other countries. She is also a regular guest speaker at settings such as the African Union and the United Nations. In recognition of her achievements, Aya was named as one of Africa’s most Outstanding Young Women Leaders in 2013. Aya has travelled to over 20 African countries working with young people and represented Africa internationally for the past four years. She considers her life’s mission uniting North Africa with the rest of the continent based on her pan-African vision, changing the narratives about Tunisia, Africa and the Middle East and promoting youth agenda regionally and internationally. Simply known as Sherine, Egyptian singer and actress Sherine Abdel Wahhab began her music career with the single ‘Ah Ya Leil’ (Oh, night!) in 2000, and has since released several albums. More recently, she has been a judge and coach on the Arabic version of ‘The Voice’ (‘The Voice Ahla Sawt’), a reality television competition for musicians now in its third season. In the latest series, Sherine’s chosen act Nedaa Sharara won the competition, which had 150 million viewers across the Middle East, according to broadcasters MBC. Prior to the airing of the season finale, Sherine made newspaper headlines when she criticsed US presidential hopeful Donald Trump for his pledge to temporarily ban Muslims from entering America. Born in Iran and raised in Beirut, television presenter Diala Makki started her career in Lebanon, where she hosted a fashion programme directed towards young people. She then moved to Dubai in 2004 to become a reporter at Dubai One. Today, Makki hosts her own talk show, ‘Mashaheer’, on Dubai TV. She has covered red carpet events and major film festivals, and has interviewed the likes of Angelina Jolie, Karl Lagerfeld, and Prince Harry. Recently, she covered the Dubai International Film Festival, Paris Haute Couture Week, and IWC Love of Cinema alongside Cate Blanchett. Makki is good friends with Syrian designer Rami Al Ali, and was the face of his 2012 bridal couture collection. She has acted in two movies by Emirati director Ali Mostafa: ‘La Tahkom Ala Mowdao Min Khelal Al Sora’ (2013) and ‘Rise’ (2014). The TV personality is considered a style icon in the Middle East, with 136,000 followers on her Instagram account. 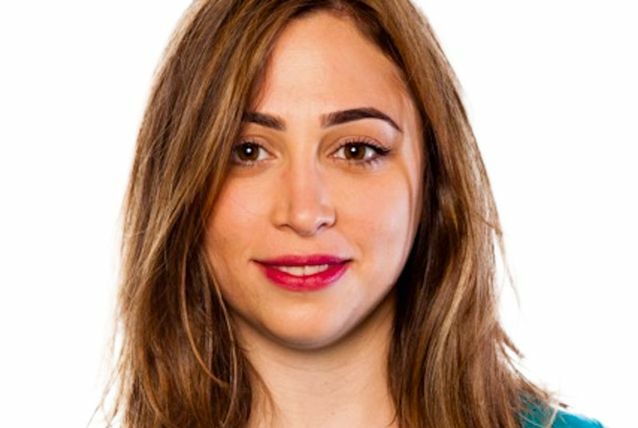 Ayah Bdeir is the creator of littleBits, an open source system of preassembled, modular circuits that snap together with magnets. Similar to how lego brought construction into millions of homes, littleBits help to make learning about electronics fun, easy and creative. 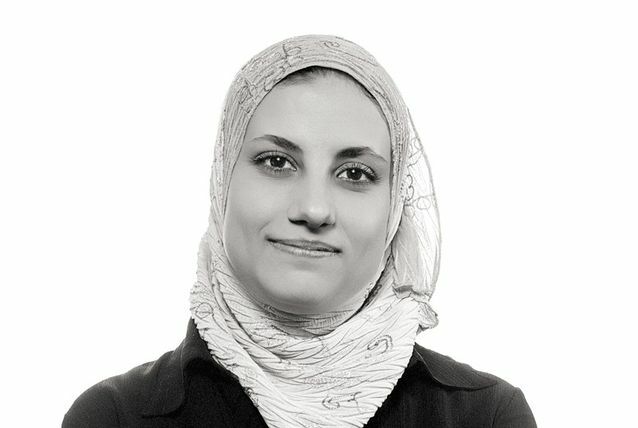 An engineer, inventor and interactive artist, Ayah received her master’s degree from the MIT Media Lab and undergraduate degrees in computer engineering and sociology from the American University of Beirut. She has taught graduate classes at NYU and Parsons and taught numerous workshops to encourage non-engineers – particularly young girls – to become interested in science and technology. She is also the founder of karaj, a media lab in Beirut for experimental art, architecture and technology. littleBits won the top prize at the Toy Fair in New York in 2012, has won the Editor’s Choice Award from MAKE magazine, and in 2011 was added to the digital collection of the prestigious Museum of Modern Art (MoMA) in New York. If he was not already known for his comedy, Riyadh-based Hisham Fageeh’s Bob Marley-inspired ‘No woman, No drive’ satire made sure he was. Produced with fellow comedians Fahad Albutairi and Alaa Wardi, the clip went viral the same day that a number of Saudi women defied the kingdom’s driving ban. 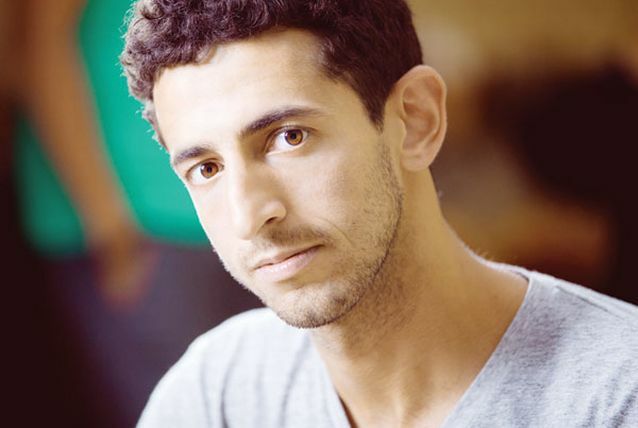 Fageeh began performing stand-up while at Columbia University and performed in Arabic in his YouTube series Isboo’iyat Hisham, which subsequently went viral. Fageeh has also turned to acting, first with a role in the short film ‘Daughter’, and then a small part in the hit Middle East-based feature length film ‘From A to B’, about childhood friends who embark on a road trip from Abu Dhabi to Beirut. Fageeh landed the leading role in the hit Saudi romantic comedy ‘Barakah Meets Barakah’, which was a surprise hit at the Berlin Film Festival. Dubai-based Huda Kattan is one of the top beauty influencers and bloggers in the region. She used her public profile to go on to found her own beauty brand, Huda Beauty, under which she runs a line of false lashes, false nails and henna tattoos, all of which are best-selling products at worldwide branches of French cosmetics giant, Sephora. Her lip contouring kit also is in the pipeline. The 32-year-old makeup artist started her career in 2010 by writing makeup tips and tricks and filming YouTube tutorials. With a 12 million-strong following on her Instagram account alone, Kattan has proven that she does more than just blog. While the blog itself made little money for the first four years, Kattan told Arabian Business this month that her cosmetics business had more than doubled over the past two years, driven largely by the beauty products. Described as ‘The Tina Fey of the Arab World’, Tima Shomali became the first female comedian in Jordan to gain a following when she launched her own web series on YouTube, three years ago. ‘FemaleShow’, a romantic comedy focusing on one couple’s path from dating to marriage and told from the woman’s point of view, has become the most popular web show in Jordan, attracting 25 million viewers. In one of Shomali’s most famous routines, she urges Jordanian women to stand up to verbal harassment on the street. When Shomali graduated from high school, with no specialised courses to follow her passion, she studied a degree in business administration, all the while continuing to write her own show. She started taking extensive filmmaking workshops, until she produced and directed her first short movie, which helped her to apply to The Red Sea Institute of Cinematic Arts where she graduated with a Master of Arts in writing and producing. Her first online work was a show called Bath Bayakha, which she wrote and starred in back in 2011, eventually leading to the ‘FemaleShow’. Since then she has produced the TV series ‘Zain’ and worked as a supervising producer on ‘Nida’A Show’, a talk show aimed at Arab women. Aleppo-based journalist Zaina Erhaim picked up the Peter Mackler Award for Courageous and Ethical Journalism in October last year, for her fearless reporting on the civil war in her home country. Despite having a safe job in the UK, Erhaim chose to return to Syria and document the harrowing stories unfolding in the war-torn country. 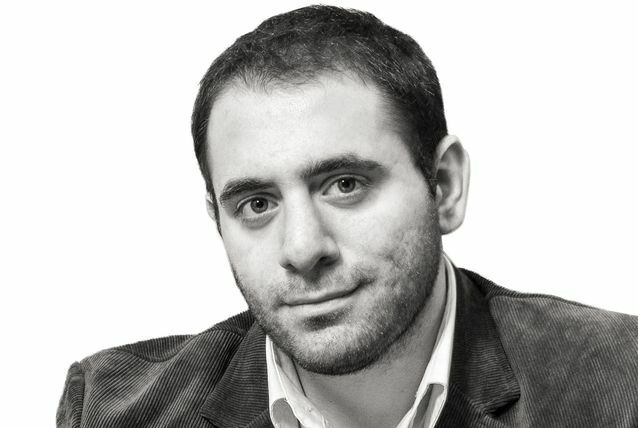 Erhaim is the Syria project coordinator for the Institute for War and Peace Reporting (IWPR), an international organisation that supports journalists in countries undergoing conflict, crisis or transition. Over the last two years inside Syria, she has trained about 100 citizen reporters, approximately a third of them women, in print and TV journalism, and has helped establish many of the new emerging independent newspapers and magazines in the war torn country. She works both in Arabic and English to teach and contribute her own reporting to Arab and Western media, including the British magazine The Economist as well as The Guardian newspaper. She also often speaks to other media outlets as an on-the-ground journalist witness. Lebanese pop singer and entertainer Myriam Fares set records on the music streaming service Anghami for most played artist and most played album for her fifth album ‘Aman’ last year. Referred to as the Queen of Stage, Fares released her first album ‘Myriam’ in 2003 and the release of the single ‘Ana wil Shoq’ – and accompanying video – proved to be a turning point for her. The song was played throughout the Arab world and shown across Arab TV. She further gained popularity via her YouTube videos, which showcased her fusion style of traditional music and pop. She followed the success of Myriam with her second album Nadini in 2005, and a third studio album ‘Bet’oul Eh’ (April 2008) and her fourth album, ‘Min Oyouni’, which was released in September 2011. Fares made her acting debut in the hit Lebanese-Egyptian drama series ‘Itiham’, released in 2014. She married her long-term boyfriend Lebanese American businessman Danny Mitri in August 2014 after 10 years of dating and gave birth to their first child last month. A prolific social media user, Fares has 5.1 million followers on Instagram, where she first posted news of her new born son, Jayden. Solar energy is set to grow by 1,000 percent, Sami Khoreibi predicted earlier this year, which is good news for his company Enviromena, the largest solar integrator in the MENA region. 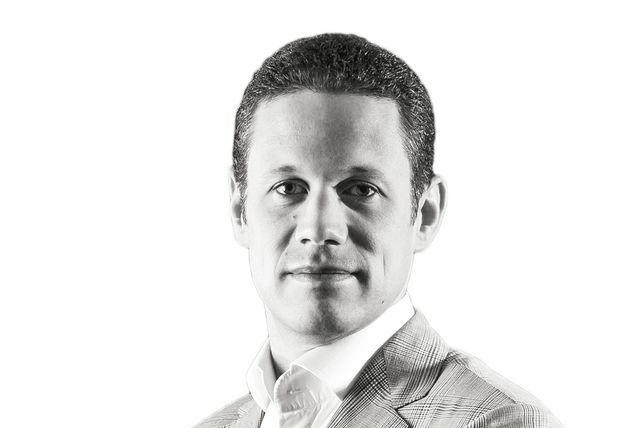 Khoreibi was originally a founding partner of Candax Energy, an international upstream oil and gas company with production assets in Tunisia and exploration properties in Africa and the Middle East.Candax completed a $66m brokered financing deal with a Canadian investment bank in 2005 and was publicly listed on the Toronto Stock Exchange nine years ago. The following year he became a founding member of Petrodex, an exploration and production company with assets in the US and exploration properties in the Middle East. In 2007, the ambitious entrepreneur became a founding partner and CEO of Enviromena, and was awarded ‘Entrepreneur of the Year’ at the 2008 Alternative Energy Awards. As well as being recognised as a Young Global Leader at the 2012 World Economic Forum, he was named one of the top five ‘Arab Innovators’ by the MIT Technology Review in 2012. Khoreibi told Arabian Business in January that the sharp fall in the price of hydrocarbons was an incentive for GCC governments to supply low-cost solar energy to the grid. With record low prices for solar energy in the UAE, solar was allowing the region to address its growing energy demand in a fashion that does not require additional spend on energy subsidies, he said. “There’s more activity than ever before. In the next 12 months we expect more contracts as we bid for projects across this region,” Khoreibi said. Emirati YouTube sensation Futaim Al Falasi has an audience in the hundreds of thousands. Better known as Taim to her listeners, Falasi started on her path to fame with two humanitarian campaigns and published her online entertainment magazine during her time at Zayed University, where she studied visual communications. For her magazine, she produced videos with four celebrities that went viral to over 1 million viewers on YouTube. She harnessed that after college, starting her own YouTube channel, which now has close to 400,000 subscribers and has had more than 63 million views since it started in 2012. The videos feature blogs from wherever she is in the world. Falasi also started an online radio show, which has been rated as the most listened to in the Arab region. Naturally, Falasi has a strong social media presence with 1.8 million Instagram followers.